This year we decided to avoid draught-stricken California when planning our big summer trek. We reasoned that the Sierra had received so little snow the previous winter that the grass would be brown and the streams reduced to trickles by early August. We wanted to go where the flowers would be blooming, so we headed fifteen hundred miles north to the Cascade Mountains in Washington. 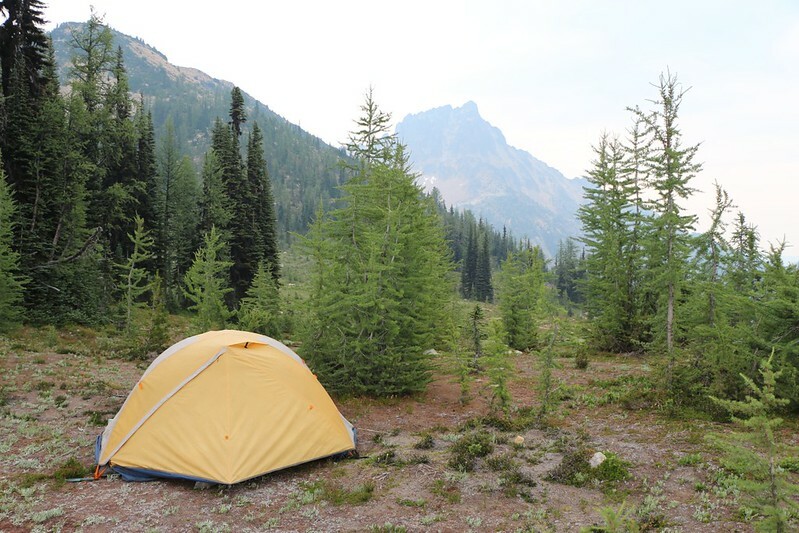 After some research online, we narrowed it to the Pasayten Wilderness in the Okanogan National Forest, just east of North Cascades National Park. 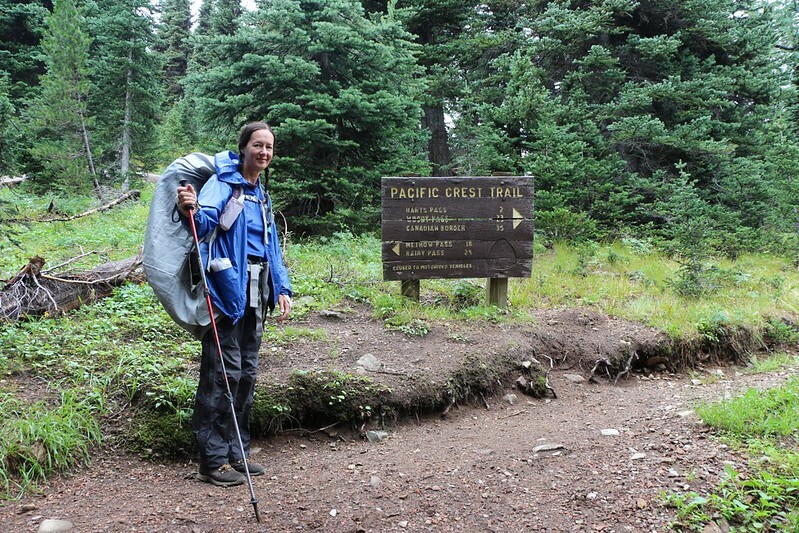 We would be hiking on the final, northernmost section of the Pacific Crest Trail. 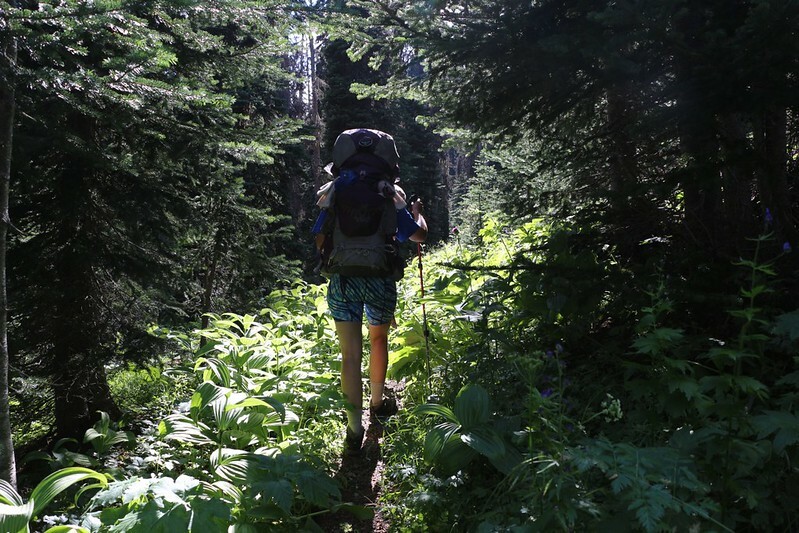 This felt right to us, as we’d been hiking so many sections of the PCT these last two years. It was like visiting an old friend in his new home. We took the scenic route to get there. We left in the early morning to avoid L.A. traffic, then headed up 395 alongside the eastern Sierra Nevada to Bishop. We turned northeast into Nevada and continued along many lonely (but excellent!) two lane highways and saw some beautiful country. We stayed at a hotel in Wells, then headed north into Idaho. 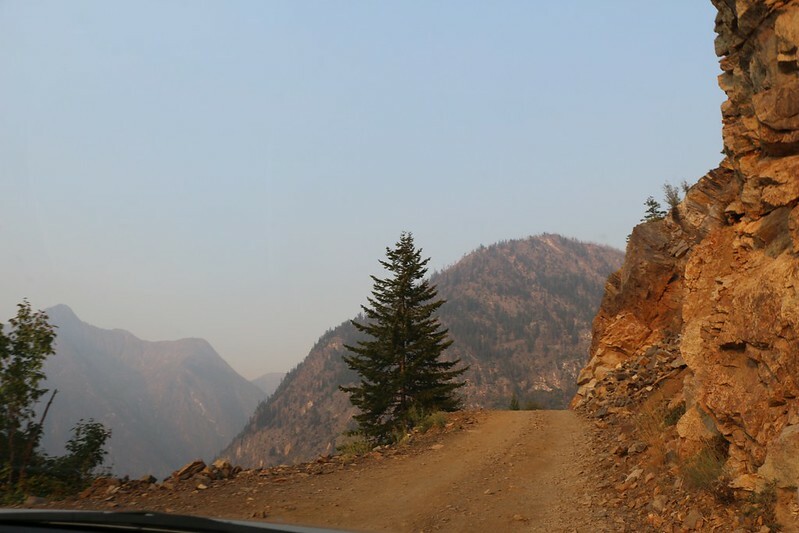 We drove along other backroads, and along the Snake River, heading northwest into Oregon and then Washington. 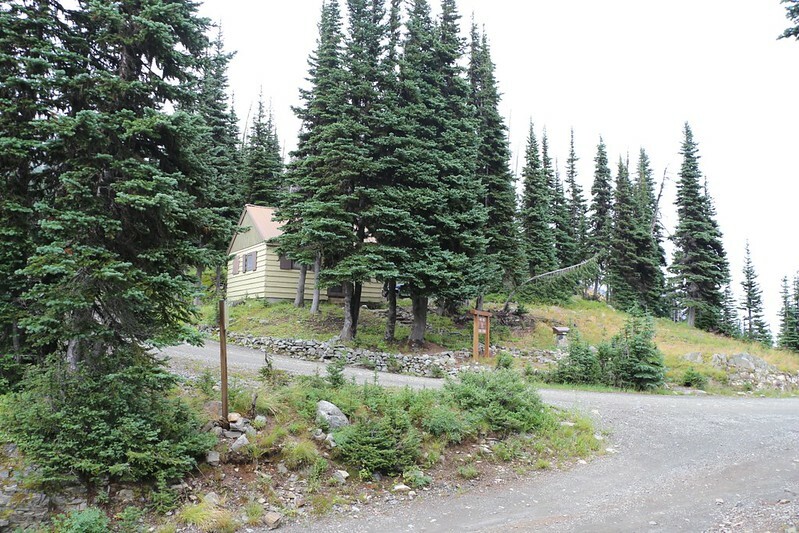 We arrived at our Hotel in Twisp on August 10th, ready for ten days of backpacking. 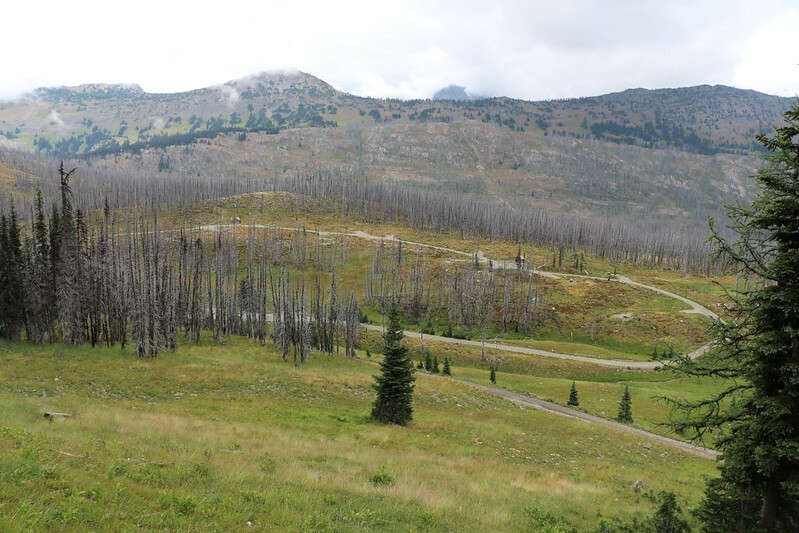 Summer 2014 conditions on the east side: Residue of the Carlton Complex Fire. 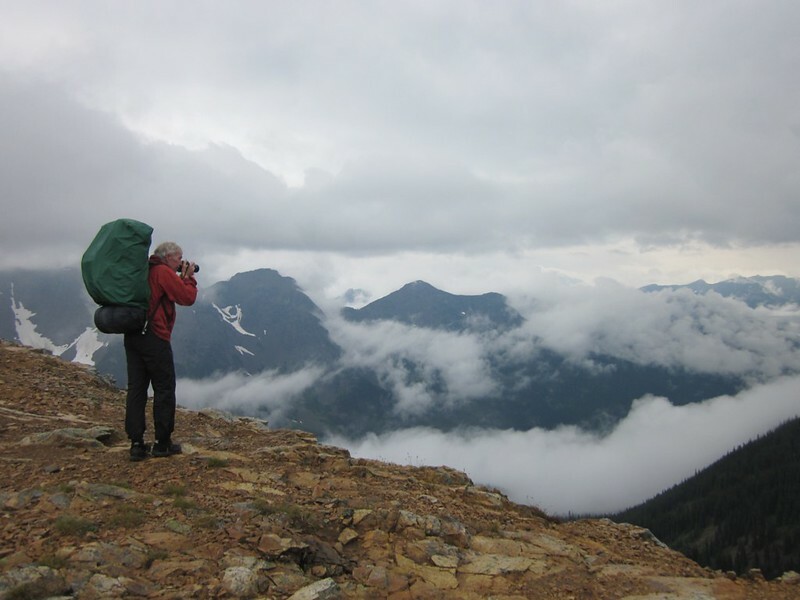 That evening, we decided to re-pack our food and stash over half of it in a cache up at Harts Pass, to save carrying twenty pounds for thirty miles. It was a twenty mile dirt road, but it would be worth it. Plus, we could check and see if there was any water up there, and if there wasn’t then we’d leave a cache of that as well. Hefting our re-packed packs was nice: Vicki’s had no food at all, and I had two less bear canisters of food. 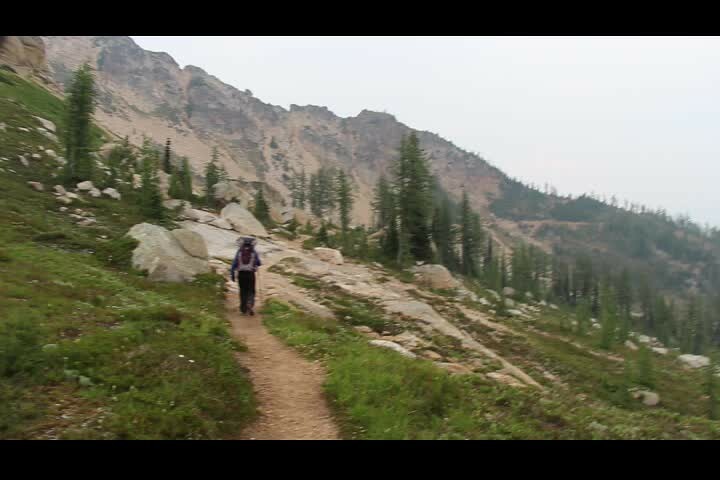 We were feeling pretty good about the first day’s long climb up to Cutthroat Pass. And that’s what we did. We stashed the food in the woods near the pass by the trail, discovered that there was plenty of water (yay! 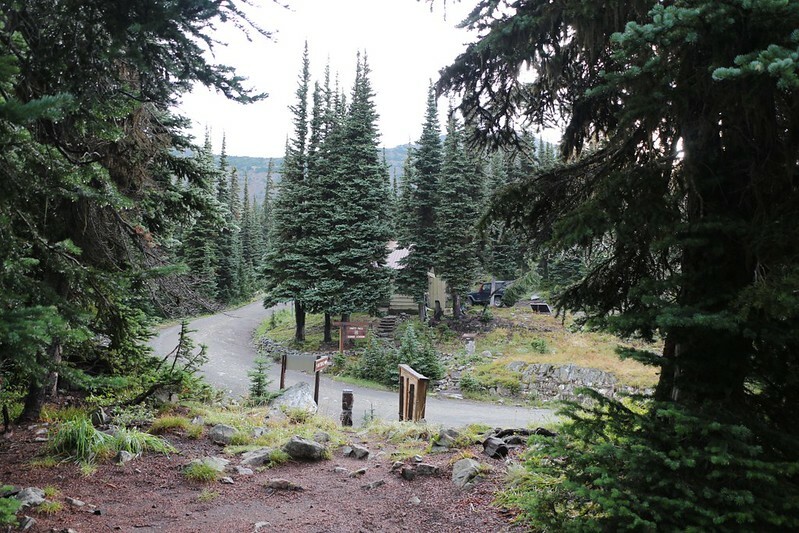 ), and then drove to the PCT’s Rainy Pass Trailhead. 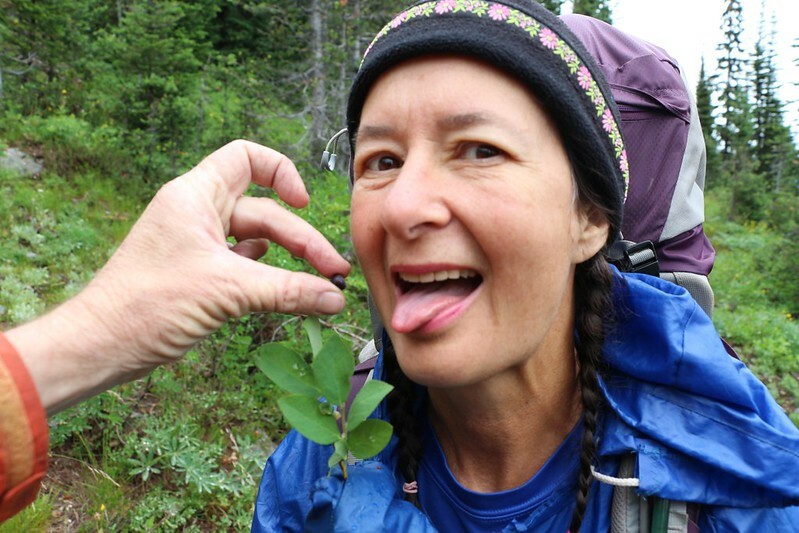 We put on our packs and hiked about a quarter mile or so, then climbed up a hillside and stashed our big packs in a hollow near a big dead log and covered them with fern leaves. Back once again at the car, we drove off to our hike’s terminus at Ross Lake (26 miles away) and parked the car for good. We felt almost naked, having stashed nearly everything we owned! We grabbed our hand-made sign and stood out on the highway and put out our thumbs. 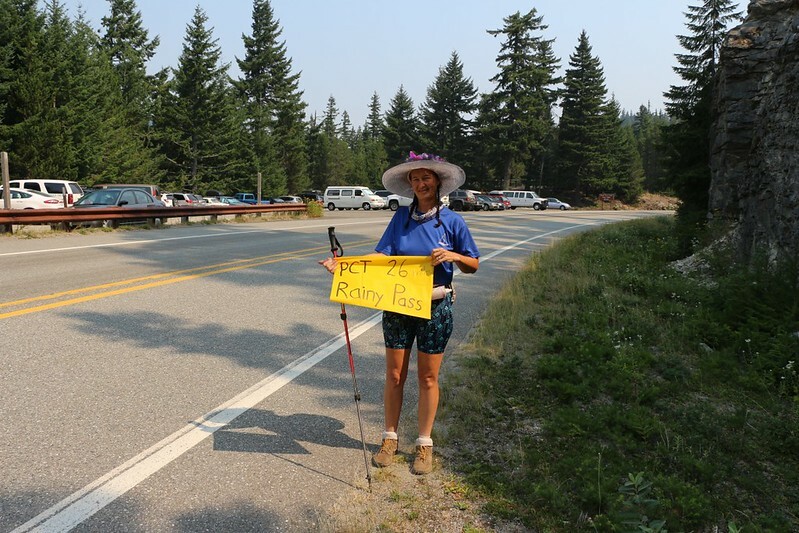 It was time to hitchhike back to the trailhead! It took us over an hour each way on Harts Pass Road. Vicki hitching a ride from Ross Lake. When it comes to hitchhiking, having a girl with you is the only way to go. Even in the mountains where people are kind, a lone man might wait hours for a ride. In contrast, we got a ride within about five cars! And we were picked up by a single woman, which is kind of amazing. She told us not to tell her mother that she’d picked up hitchhikers, and we agreed. (If her mother is reading this: Please skip this paragraph!) She was very nice, and was heading home to Montana. She loves the Cascades and so decided to drive through the park on Highway 20 rather than on the big old boring interstate. And we’re glad she did. She dropped us off at the trailhead and we wished each other well. It was time for us to begin our adventure! 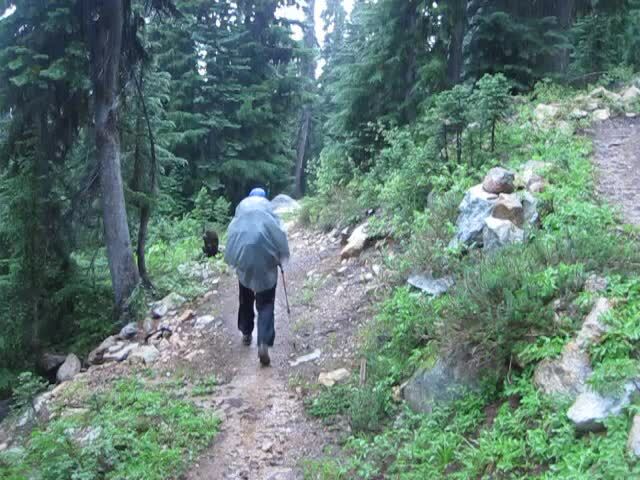 We got back to Rainy Pass about noon, and started our first easy day of hiking. 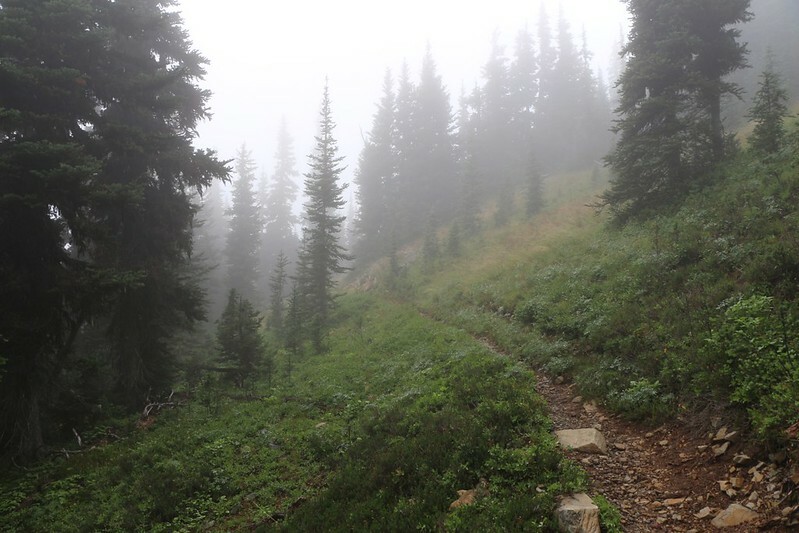 Our goal was modest: A mere four miles uphill toward Cutthroat Pass. 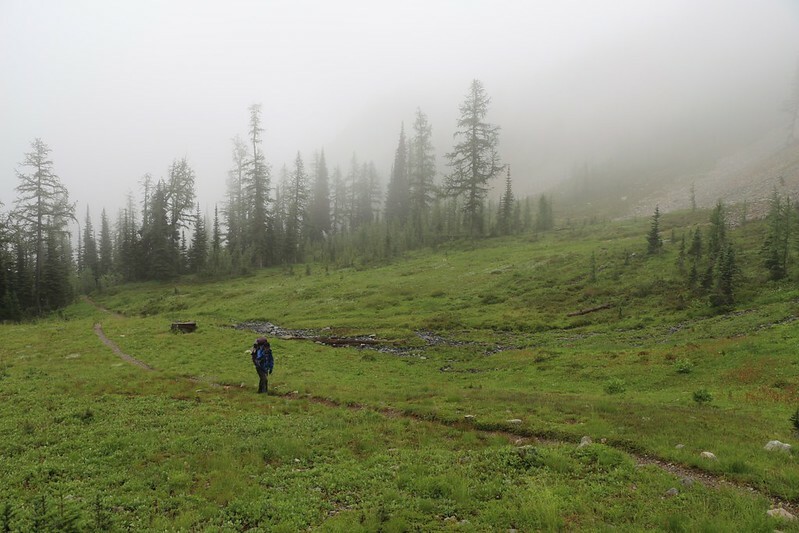 We retrieved our stashed packs near the Rainy Pass Trailhead – Let the hike begin! We picked up our packs from the stash spot and started hiking. Even though it was already past noon we weren’t too worried: We only had four miles to hike, as we had planned for an easy day in order to do to all the logistics of hitchhiking and pack-stashing. It was hot out there, and the air was still full of smoke from the nearby Carlton Complex Fire, which was (hopefully) in its last stages and would be out soon. 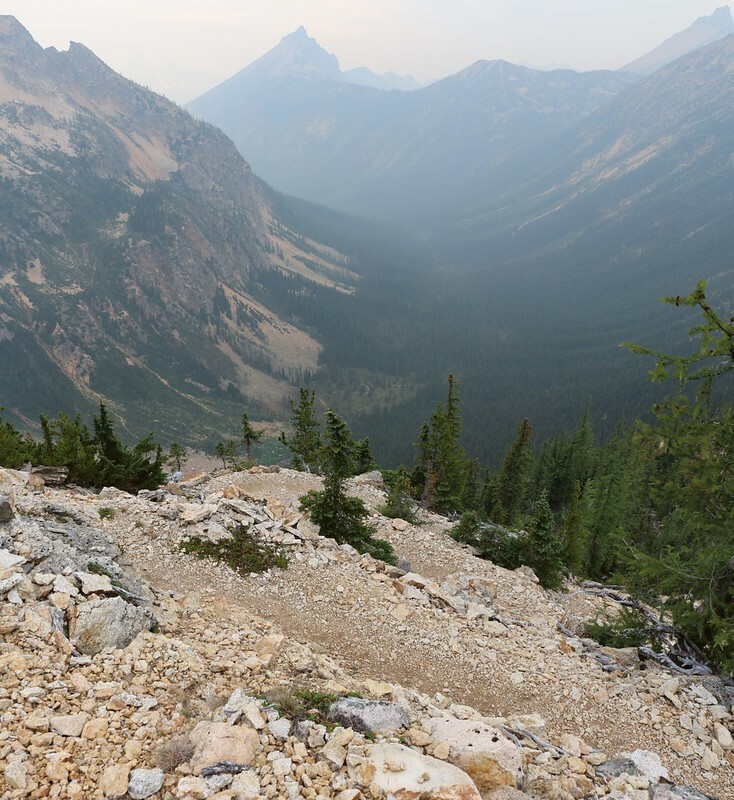 The nearby peaks were hazy with smoke, which made the views less awesome than they otherwise would have been. The weather report said that it might rain soon, so the smoke might clear eventually. Not that we wanted rain. But we were ready for it if it happened. Black Peak (elev 8970 ft) from the PCT west of Cutthroat Peak. 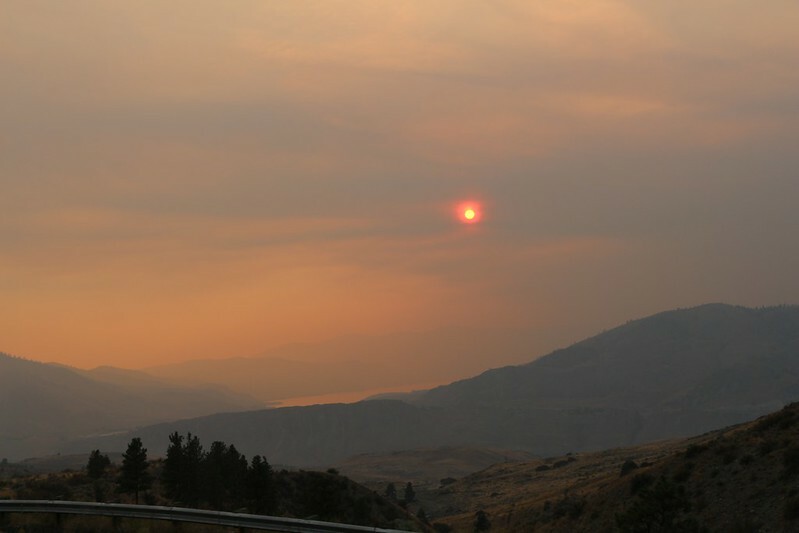 The smoke was better here, west of the fires, but visibility was poor and you could smell it constantly. 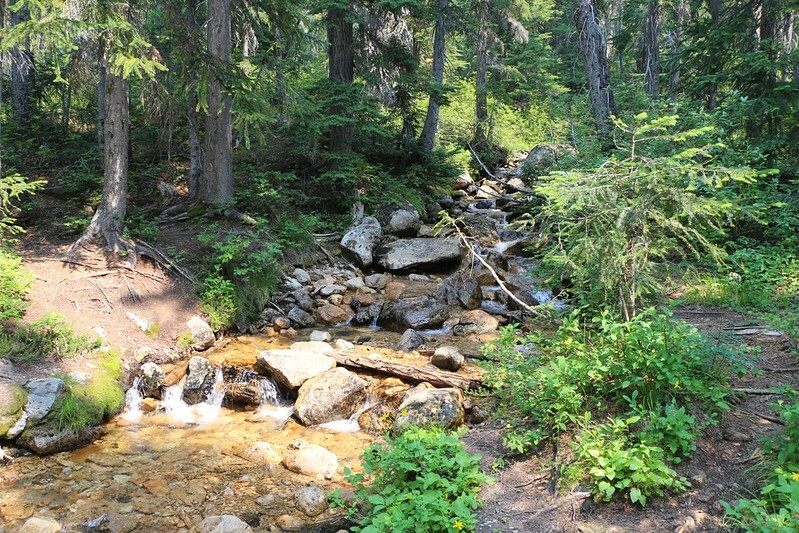 We hiked uphill through the forest, and crossed Porcupine Creek, which was flowing well. We met a work crew from the Washington Trails Association and they said that there was plenty of water up at the campsite, which was a relief. 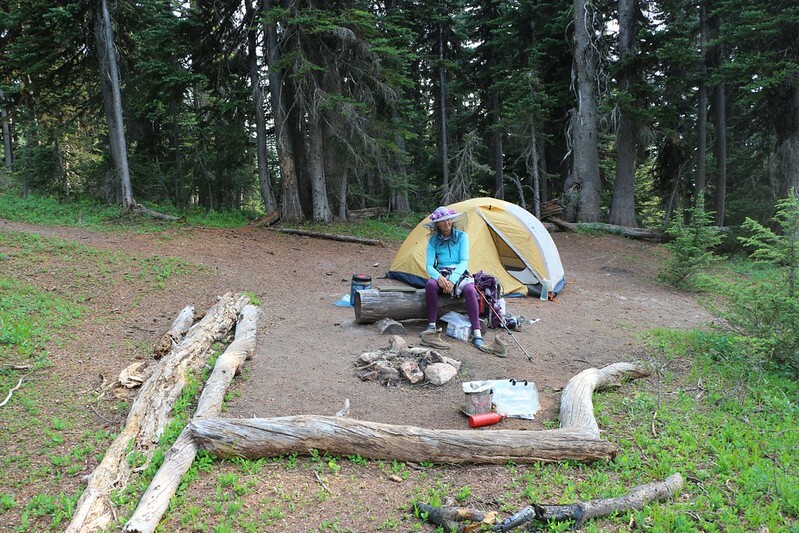 This is camp “CS2603” on the PCT, meaning that it is on mile 2603. 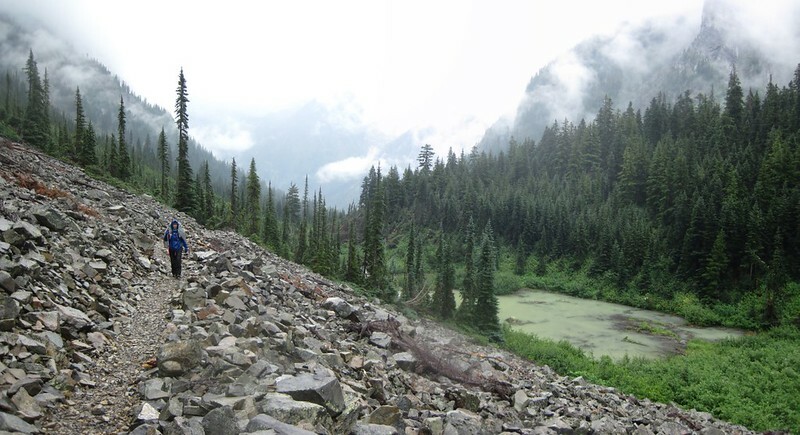 (We’d started hiking at Rainy Pass at mile 2599, whereas mile 0 is the Mexican Border.) All of the reading I had done about this stretch of the PCT was that it was often dry late in the summer, and that there was a “Water Alert” shown on the map for the next twenty miles. So we weren’t taking any chances. Which was why I was carrying WAY too much water. Oh well. 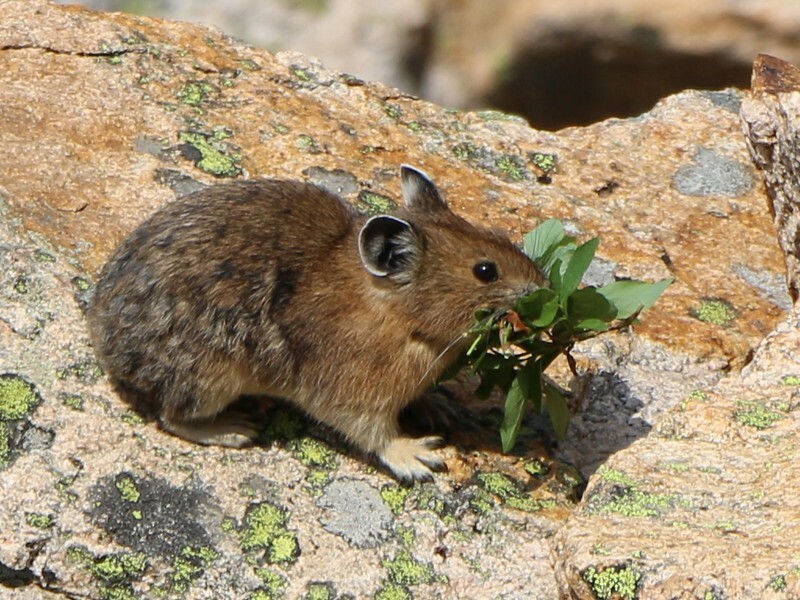 Good thing we’d left all that heavy food stashed up ahead at Harts Pass! 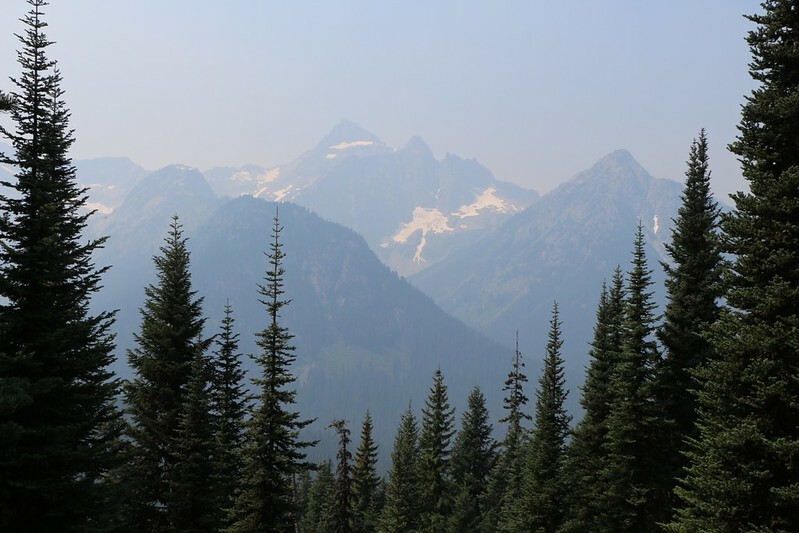 Hazy, smoky view of Peak 7762 from just above our campsite. There were other mountains out there, but we couldn’t see them. The campground had a number of sites, but we had the place to ourselves. Not counting the mosquitoes. But they weren’t bad by comparison with our Banff trip two years ago, so we weren’t complaining. Much. The PCT guidebooks call this site CS2603 as it lies on mile 2603 of the PCT. Rainy Pass was at mile 2599 out of 2660 total miles to the Canadian border. 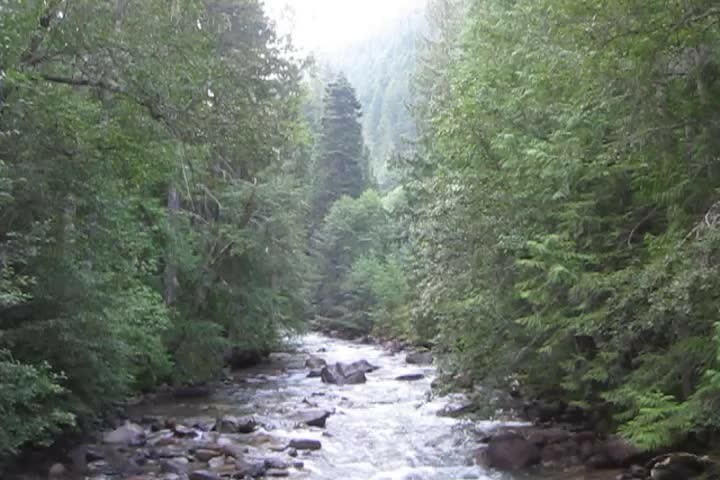 Although it was up pretty high, Porcupine Creek was still running at the campsite, so life was good. 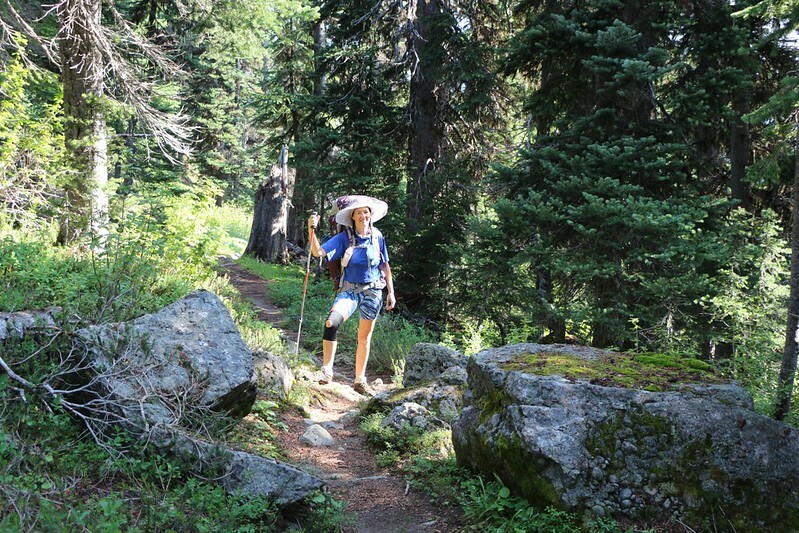 The PCT guidebooks had warned of waterless areas at higher elevations in late summer, and with all the fires we figured the forest would be dry as a bone. Not so! We filtered some water, cooked some dinner, and hit the hay early. We’d gotten up before dawn and tomorrow was going to be a long day. The drizzling started just after we’d packed our gear, which was nice. It also cut down the smell of smoke, but it certainly didn’t improve the visibility. We woke up to cloudy skies and hazy views. We couldn’t smell the smoke but suspected that we were getting desensitized to it. It looked like a change of weather was in the wind, with possibly a day or two of rain. We didn’t really want the rain, but we were prepared for it, and, if it put out the big fire, then we figured that maybe it was worth it. We packed up our gear at first light and got moving. Luckily for us, it started drizzling AFTER everything had been put away, so I didn’t have to carry a soggy, extra-heavy tent all day. It was a very light drizzle, which kept things cool. Vicki liked this weather while we were climbing toward Cutthroat Pass; she hates overheating on uphills. 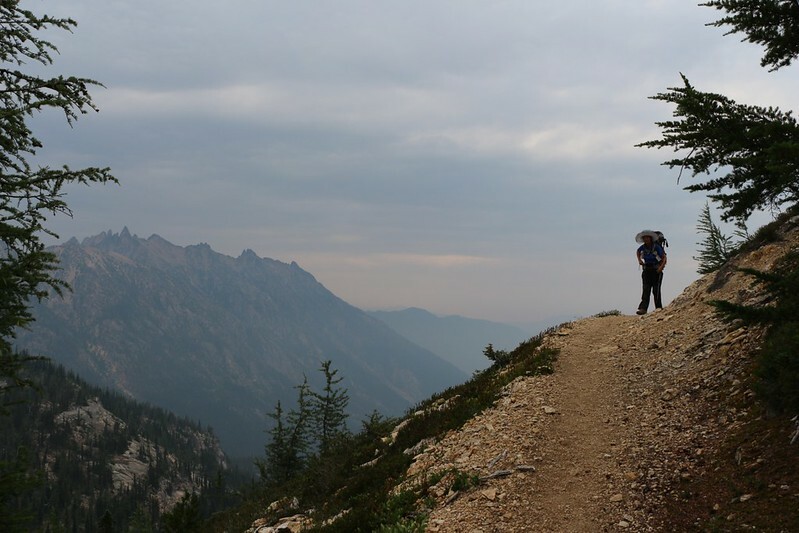 I wasn’t very happy, however, as I had to hide my camera in the drybag, and the drizzle prevented me from seeing (and photographing) all the extraordinary views that this high-altitude section of trail was famous for. Sad but true. 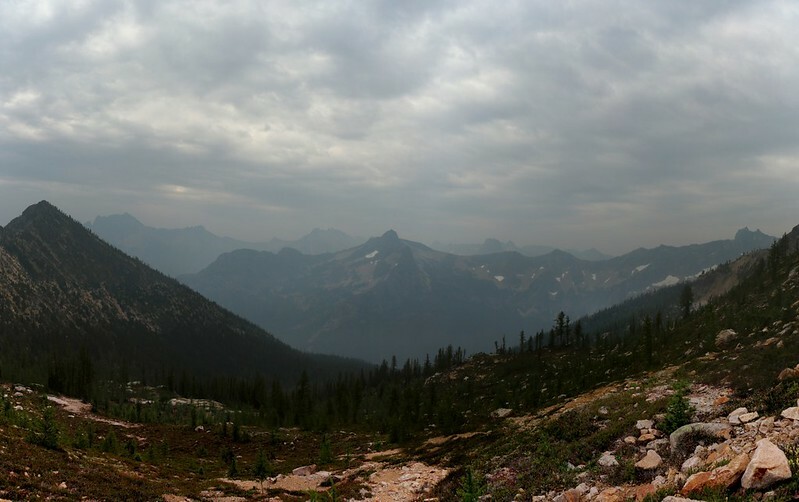 Not far from Cutthroat Pass, looking back, SSW toward Cutthroat Peak (far left) in the drizzle. 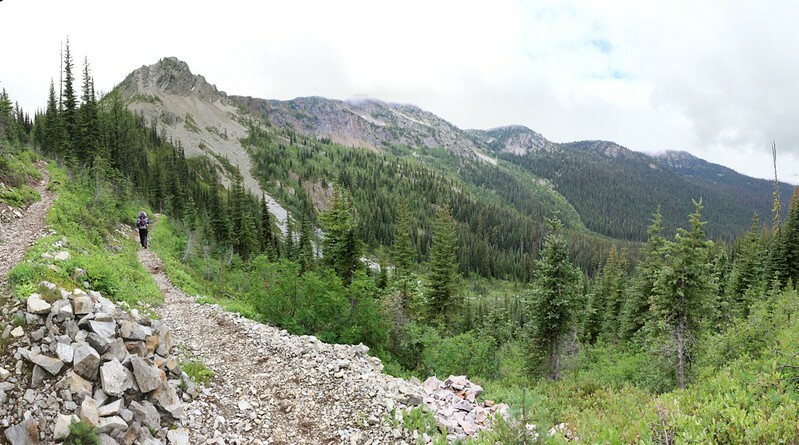 We made it to Cutthroat Pass and continued onward along and across a talus slope. 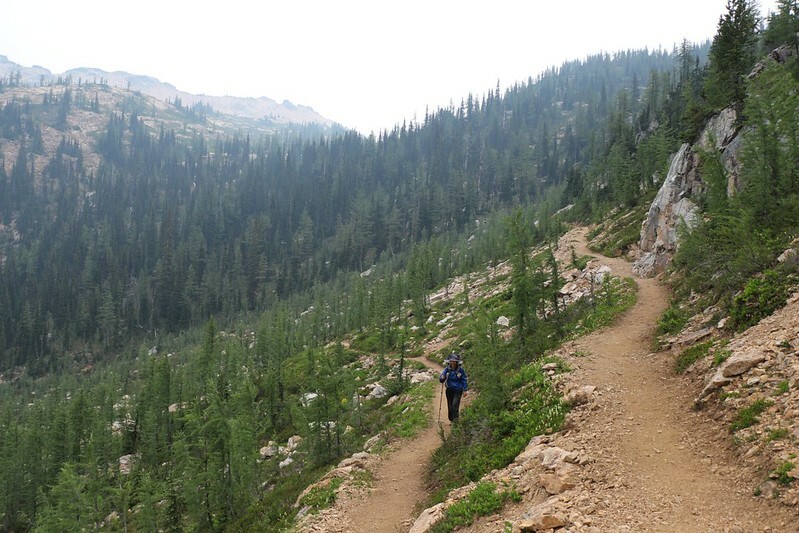 The trail then descended some steep north-facing switchbacks on the way to Granite Pass. I was carrying two pairs of Yaktrax (rubber and metal traction-enhancing aids that pull on over ones hiking boots) as I had read that this section was often dangerous with unmelted snow and ice late into the summer. But there was no snow whatsoever this August. Arghhh! An entire pound of weight could have been left out of my pack! 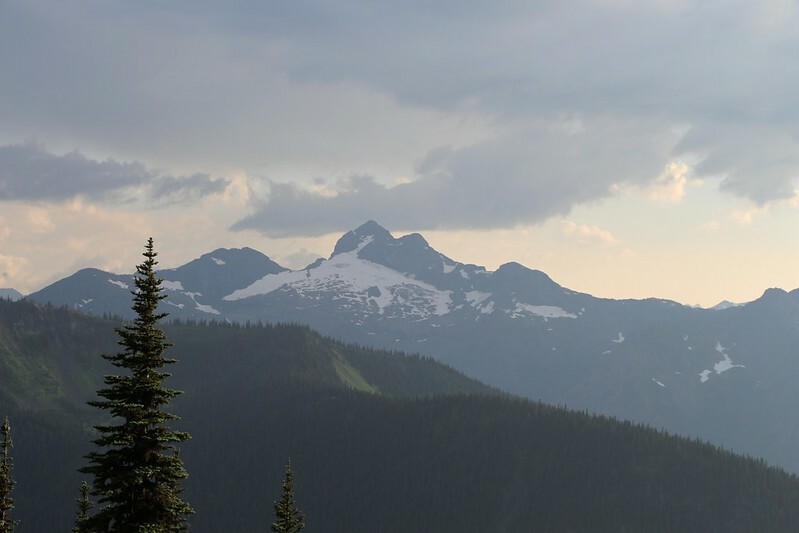 Mount Hardy, Golden Horn, and Tower Mountain from the PCT south of Granite Pass. 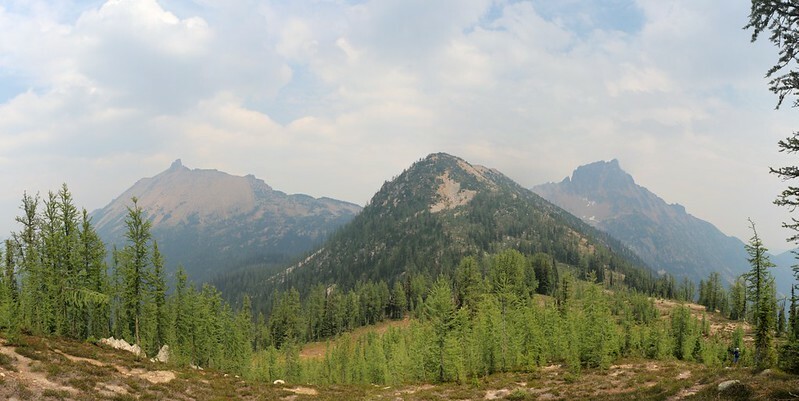 Methow Pass, our destination, is in the far distance directly above that tall pine in the center of the shot. 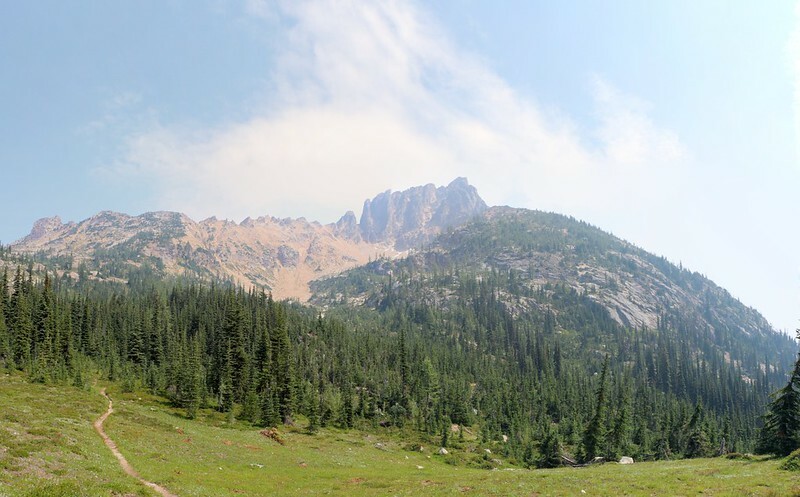 We continued around the valley under mighty Tower Mountain, and eventually arrived at Methow Pass. 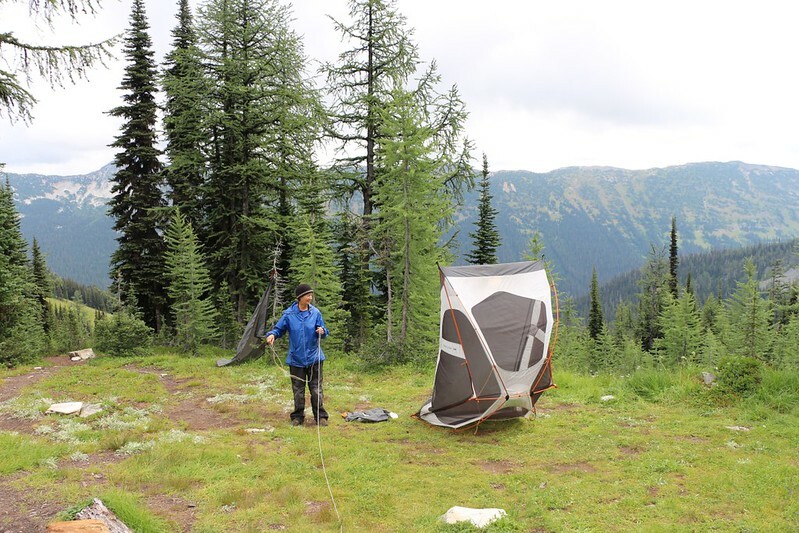 We set up camp, then hiked back to the last stream that we’d found and filtered enough water to get us far down below Methow Pass the next day, where we knew there was a large stream. Golden Horn, Peak 7140, and Tower Mountain from just above our campsite at Methow Pass. In the middle of the night, it began raining in earnest. We lay there, dry in our tent, listening to the rain pouring down on the nylon just above us. The intensity of the drumming changed over time, as clouds of varying thickness and wind gusts of varying strength flew by in the darkness. The sound would change from a light misty patter to a staccato blast of impacts. We’d doze off, then awaken again to yet another rain mode: Continuous Pounding. Every so often I’d turn on my headlamp to check around the tent for leaks, and to be sure that our goose down sleeping bag was away from the edges and corners of the tent. Normally, being dry and snug and warm inside a tent with your lover while the rain whips down outside is a recipe for romance (and it was!) but we couldn’t stay inside all day, and we knew that it might well keep raining for two or more days, so we had no choice but to get up, pack up, and suit up. Both our schedule and our food reserves wouldn’t permit taking a “rain day” no matter how tempting, sitting around reading books and playing cards. We also decided not to cook breakfast, to avoid cooking in the rain. We had at least one meal that required no cooking, so we sat in the tent and ate it. We packed everything we could without going outside, placing all of our gear safely inside waterproof plastic bags. 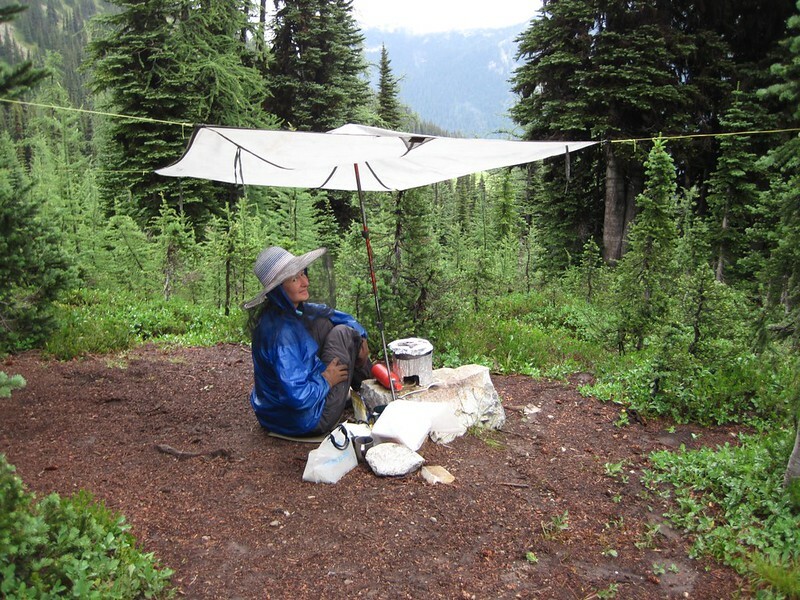 When the rain let up for a brief spell, we jumped out and packed up the tent, shaking drops off the outer tarp like a dog from a bath. 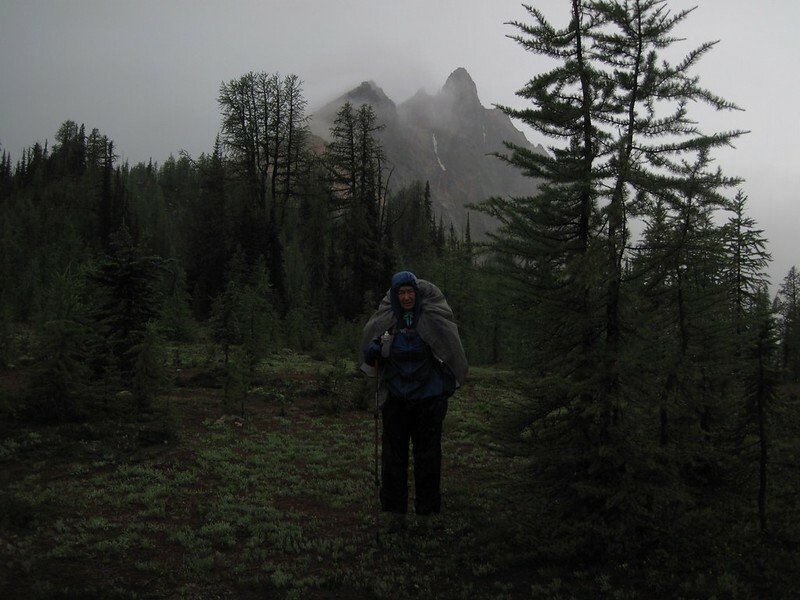 Vicki in raingear with Mount Hardy in the clouds as we prepare to hike north from Methow Pass. 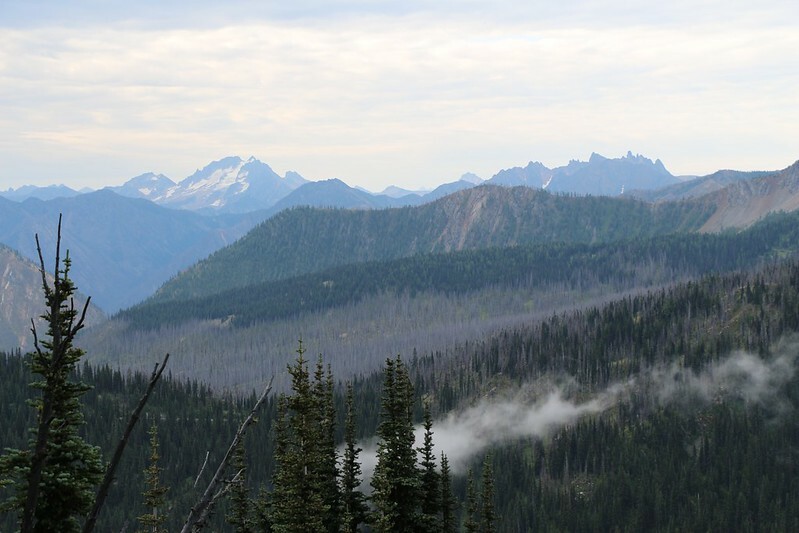 A heavy mist was shrouding nearby Mount Hardy, and Tower Mountain could barely be seen as we began to hike north from Methow Pass. 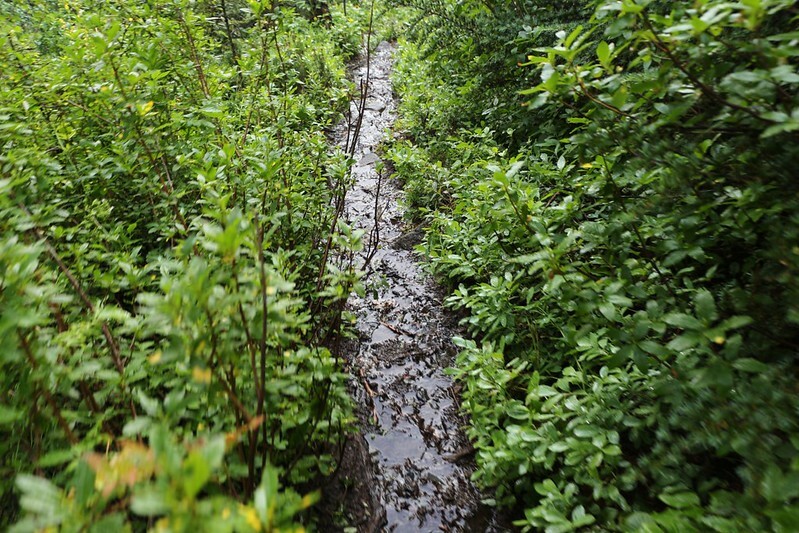 The trail wound down into a long valley, and there was water rushing downhill all around us. It was nice to hike on a gentle downhill slope, and we made good time. There were no views to speak of, but that was OK as we were in the midst of tall pines. The smell of wet loam and pine bark was wonderful. 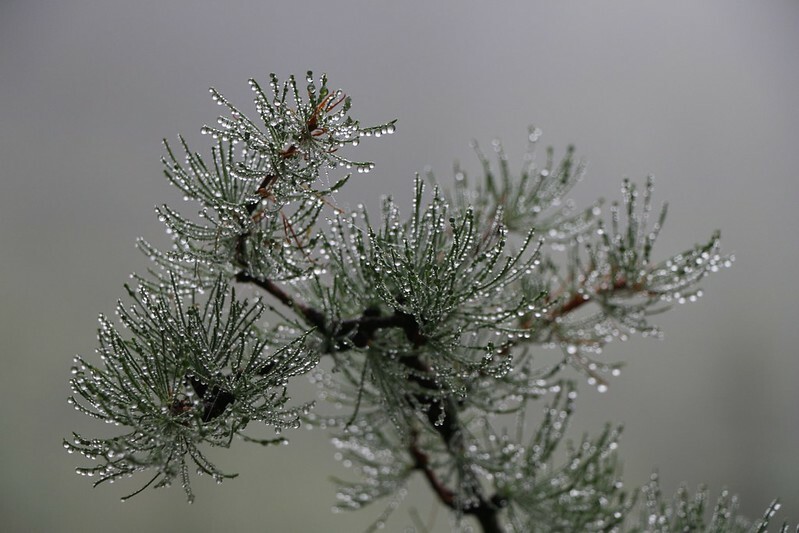 The rains continued sporadically as we hiked, mist filtering down through the pine needles above followed by lingering large drops that plopped on our hoods from the branches. 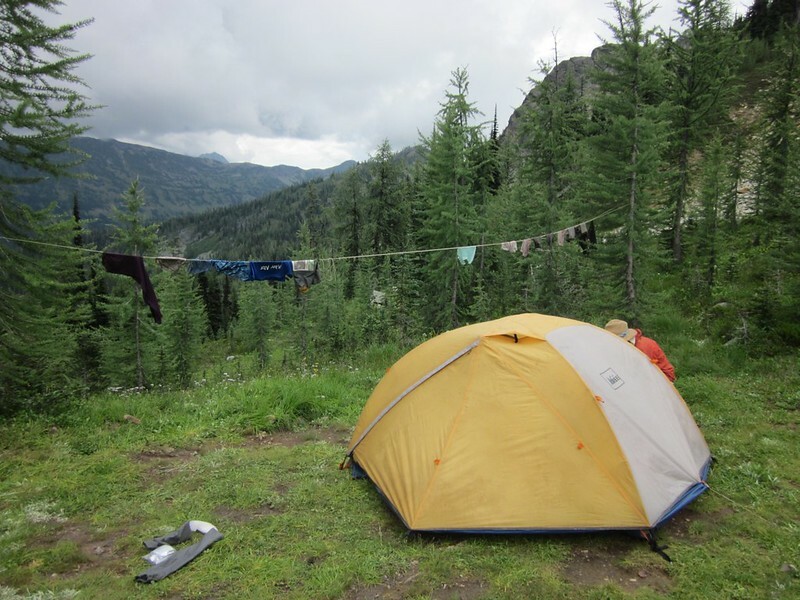 Eventually we came upon the WACS2615 campsite, right near the bridge where the PCT crosses the West Fork of the Methow River. It was a nice camp, but we weren’t stopping this soon. The river was running strong and brown with newly disturbed silt and mud from all the rain. I was glad there was a bridge! Me on the bridge where the PCT crosses the West Fork of the Methow River. Do I look like I’m enjoying this? 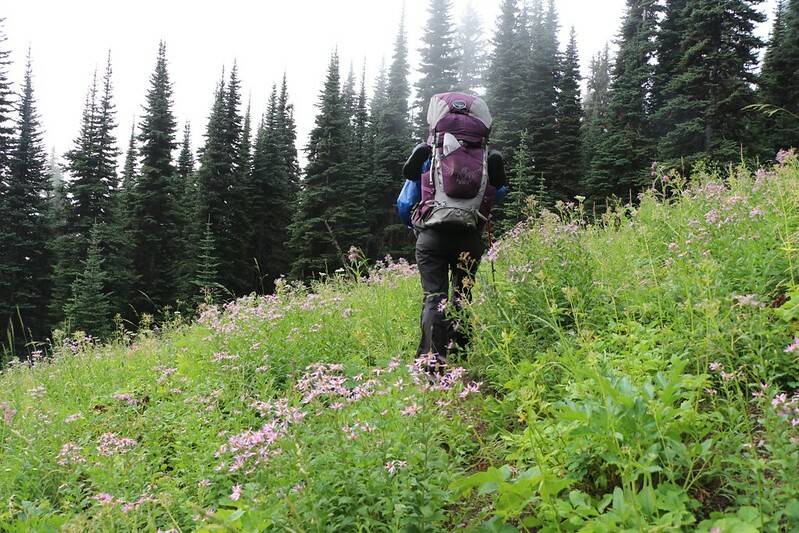 As we continued along the north side of the river we hiked through huge meadows full of knee, hip, and even chest-high wildflowers! 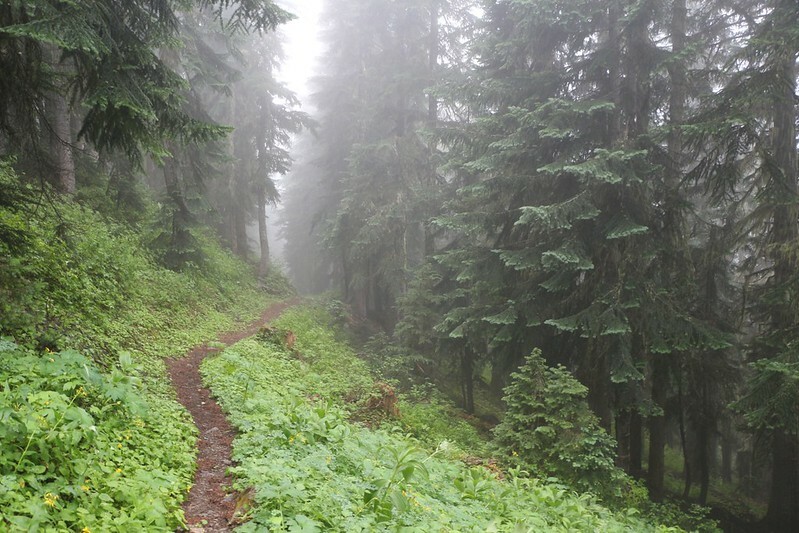 The raindrops clinging to their leaves made them heavy, and they nodded down over the trail, so we had to push our way through. Which dumped all that water onto our shoes and raingear. I didn’t tell Vicki, but I was very happy to have her leading the way that morning! She must have been drenched. Not that I was dry. Oh no. The word dry was no longer in our vocabulary! 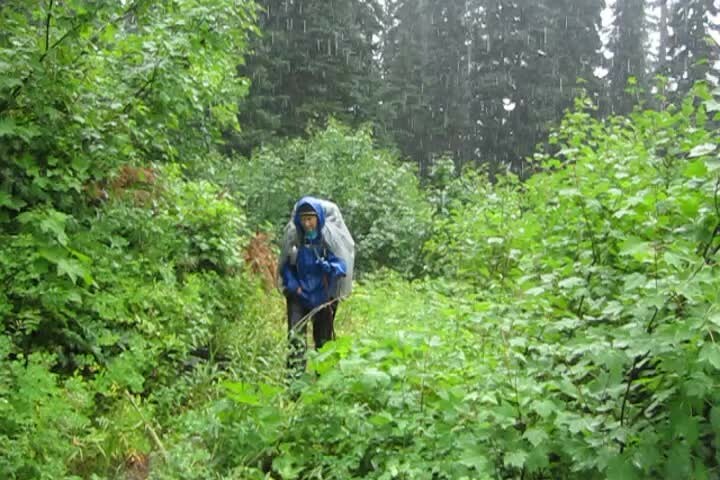 Hiking in the rain. Yes, that’s the trail! Soon we stayed high up on a hillside as the river dropped away next to us, and we came upon ripe blueberries. Yum! We stopped and had lunch, with berries for dessert. 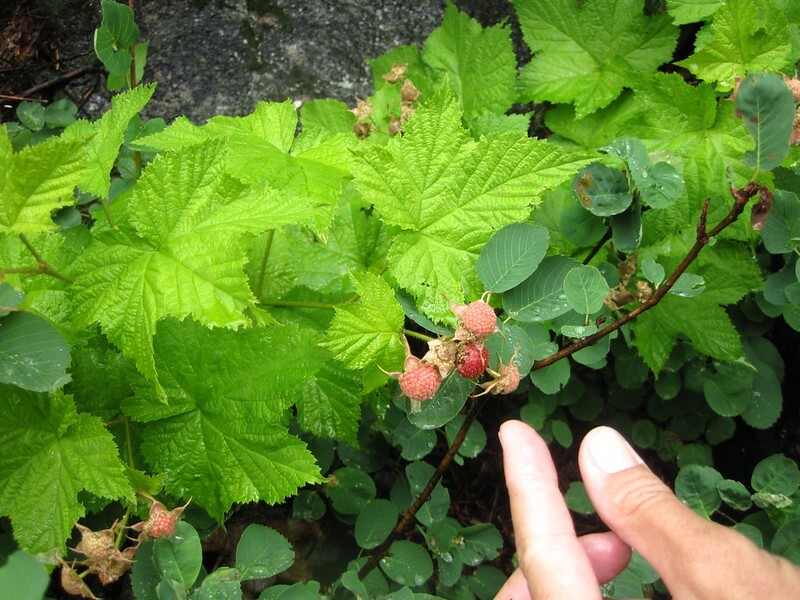 We also saw ripe huckleberries and a new berry we’d never seen before: A Thimbleberry (we discovered its name later). I wasn’t so sure about the last one but Vicki decided to try it anyway. She said it tasted fine. And she didn’t die, so there you are. 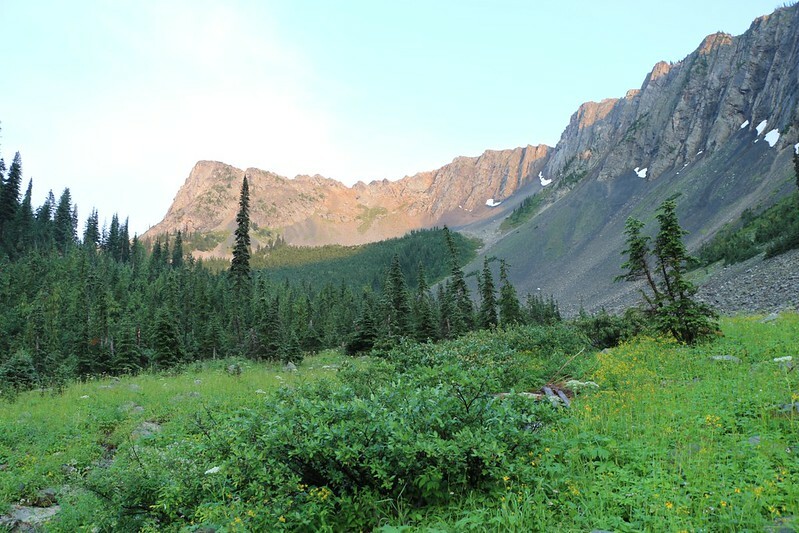 The PCT turned left and headed up Brush Creek toward Glacier Pass. 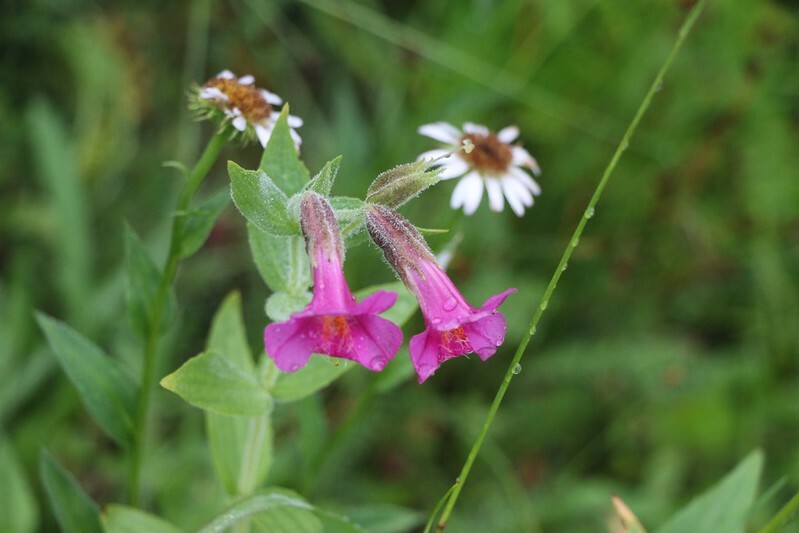 There were, once again, tons of soggy wildflowers blocking the trail, and then the rain pounded down harder than ever. Sadly, I was in the lead this time, as the trail was now headed uphill. Total Drenchville. My so-called waterproof shoes were absolutely squishing by this point. Fail! I could tell that all of the wrinkles on the skin of my toes were beginning to develop wrinkles of their own. My soaked shoes as we head up Brush Creek toward Glacier Pass. These were supposed to be waterproof shoes. Fail! My feet were squishing inside. And then, out of nowhere, the sun beamed down upon us. We stopped and looked around. It was suddenly warm. Droplets were sparkling on every surface. If we had heard an angelic choir singing at that moment we wouldn’t have been surprised. Epiphany! And, just as suddenly, it was gone. No! We’d only gotten sixty seconds of sunshine! It didn’t seem fair. The roiling clouds had closed up above us and shut out the sun for good. Oh, I admit that afterwards we saw occasional patches of blue sky far off in the distance, but we never felt the sun again that day. So much for our fantasies of having dry clothes to wear. 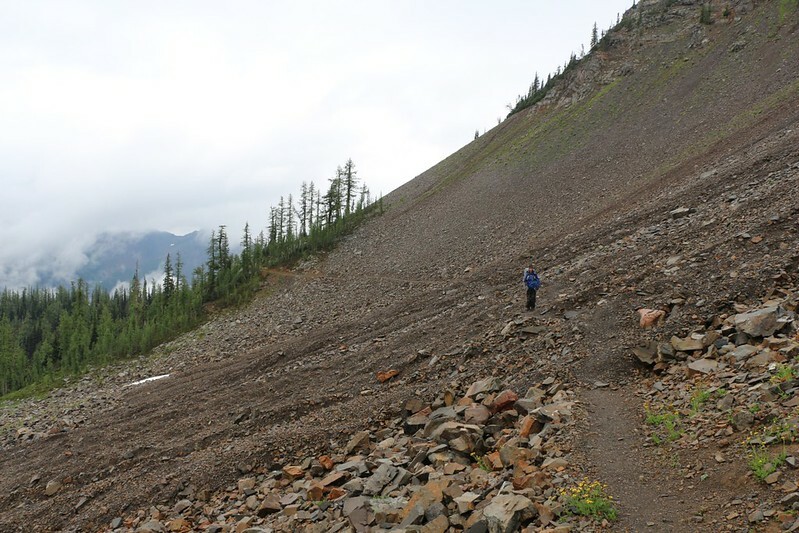 As we headed higher we came upon a huge field of talus, large jagged-edged stones that had tumbled and avalanched down from the mountainside above us, and the trail went right through the middle of it. I pulled out my GPS and looked at the map. We were standing within one hundred feet of the marked waypoint where we had imagined we might camp that night. We couldn’t have picked a worse spot! In fact, we hadn’t seen any other spots within this entire canyon, and, believe me, we had been looking. Vicki was exhausted. According to my GPS, a mile or so further was an official campsite, called CS2620, right at Glacier Pass. Was it uphill? Of course it was uphill. Vicki was not amused. But there was no camping here, so on we hiked. And, yes, we made it there eventually. There was a very small stream near the campsite, so we had water, and the camp itself was quite large; it was made for horses as well as humans. I set up the tent as rapidly as possible and got our sleeping gear set up inside. Vicki set up her rainfly over the kitchen area. Then we went down to the stream and filtered water. 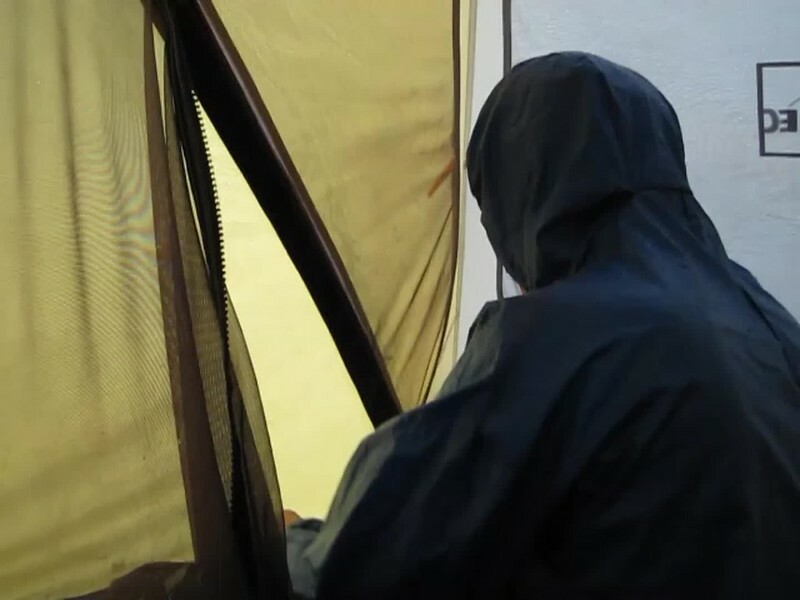 After that, we both jumped into the tent to put on dry clothes. Ahh! Dryness and warmth! What luxury! 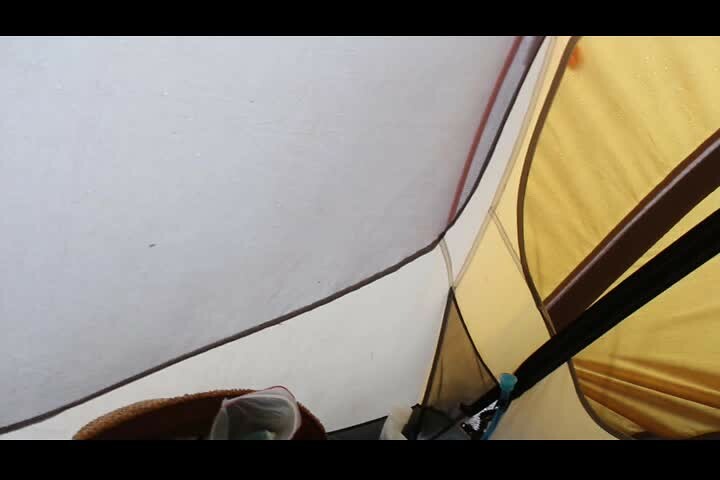 We hung all of our wet clothes to dry inside our tent. They were everywhere. It was so humid inside that we knew they would never dry. But we had to try. And we also knew that we’d have to put the cold soggy things back on in the morning. We had some hot chocolate to get some warmth back into our cores, and then ate yet another freeze-dried meal. It was good. We went to sleep before it got dark, we were so tired. Wet clothes hanging to dry in our tent at the Glacier Pass Campsite. It hadn’t rained during the night, which was nice, but the world was still wet. Vicki whipped up some coffee and breakfast while I packed up the sleeping bag and pads. After we ate we steeled ourselves for the next ordeal: Putting on those cold damp clothes. And then we got really busy packing in order to warm them up. After that, it was time to hit the trail. Uphill, of course. 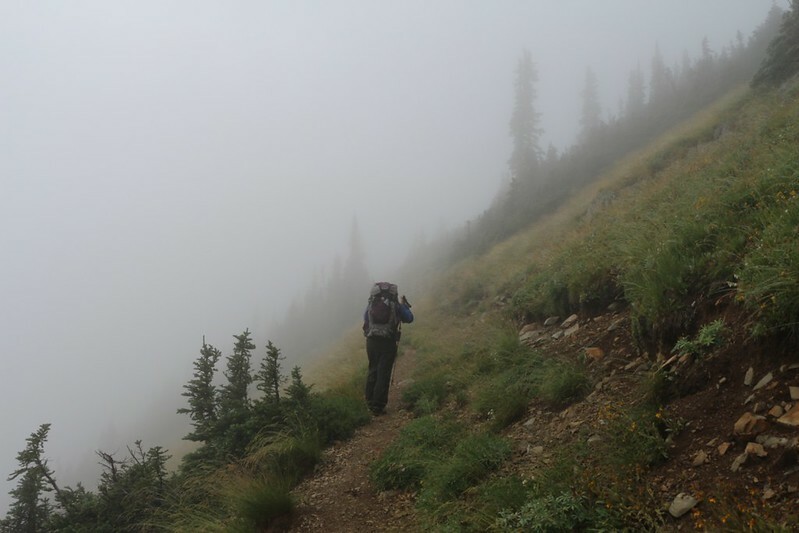 All that rain the day before was great for evaporating and making more clouds, which swirled around us as we climbed into the foggy heights above. Visibility was low, but the clouds also kept the temperature low, so Vicki was happy. Eventually we reached the top at Grasshopper Pass, and crossed over to the other side of the crest. But not until a pounding rain shower came up out of nowhere and soaked us thoroughly! It was actually kind of fun, and it didn’t matter much since our clothes and shoes were still wet. After the rain had passed, we finally gained some visibility. If there had been no clouds, we could have seen forever from here, as we were quite high up on the crest by now. At least the smoke was gone, and surely the wildfires were out for good after all that rain. We took lots of photos and videos of the clouds swirling all around. And we got many views of distant peaks to the east. 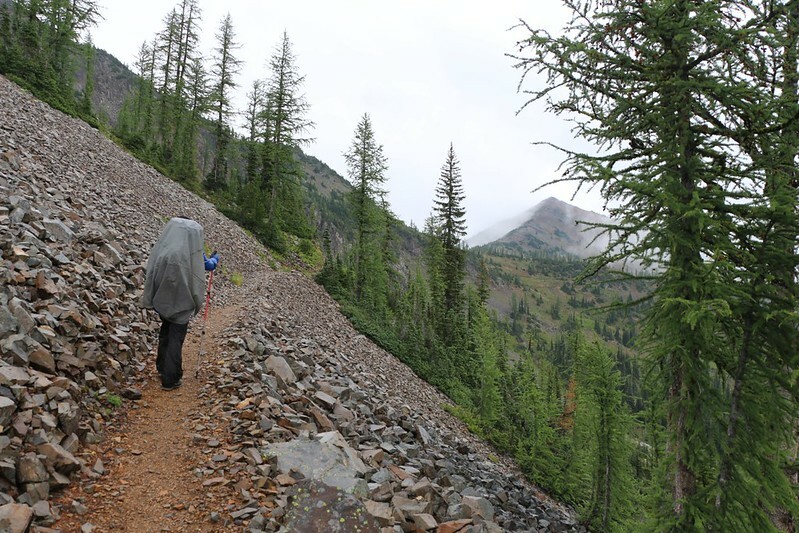 The trail stayed high and fairly level all along the ridge to Tatie Peak, crossing scree slopes along the way. In some places the trail itself had been washed out during the prior year, but there was minimal danger as we followed the footsteps of others across the narrow gulleys. Looking back at Grasshopper Pass and Azurite Peak (8400 ft). Mount Ballard, Peak 7728, and Peak 7385 from the saddle just south of Tatie Peak. Eventually, we hiked over another ridge and could see Harts Pass in the distance, our destination for the night. The trail gradually headed downhill to the pass. By the time we reached it we had hiked ten miles, and it sure felt like it! Harts Pass is off in those clouds in the distance on the right, only an hour or so away! Harts Pass Meadows Campground with many burnt pines. We didn’t camp there. We set up camp in the very first spot near the road. The man who had been camping there was packing up everything; he was sick and tired of the rain and was calling it quits. He got in his truck and left. Perfect timing! There was a picnic table and a fire ring, deluxe accommodations, and they cost us five bucks. We had one last blast of rain here, which luckily happened just after we’d set up the tent and gotten all the gear inside. It was nice to sit inside a dry tent. Other folks had to take temporary shelter under the roof of the cement pit toilet. We also picked up our food cache, and now we were ready for the long haul north and west to Ross Lake. Unfortunately, I was the one who had to carry all that extra food. 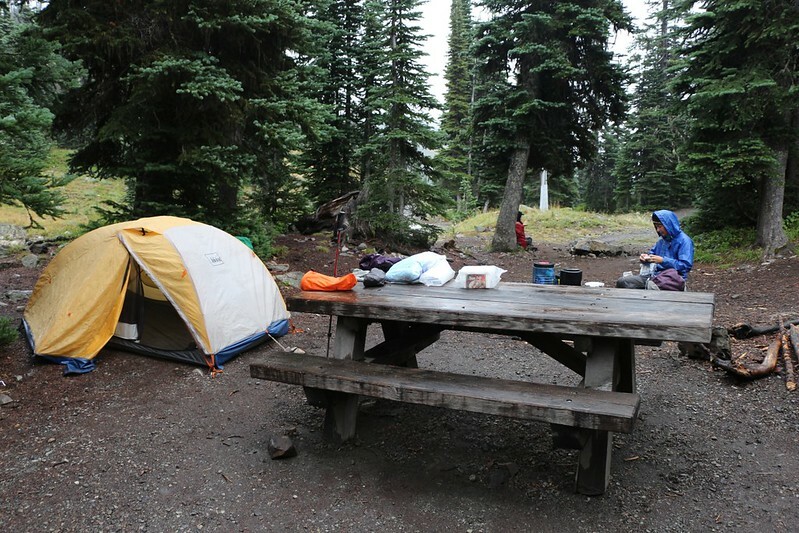 A picnic table was deluxe accommodation at the Harts Pass Campground. Well, being in a civilized, developed campground isn’t all that it’s cracked up to be. We were camped in the first spot near the road across from the “guard” station, so there was more foot and vehicle traffic than you might expect. 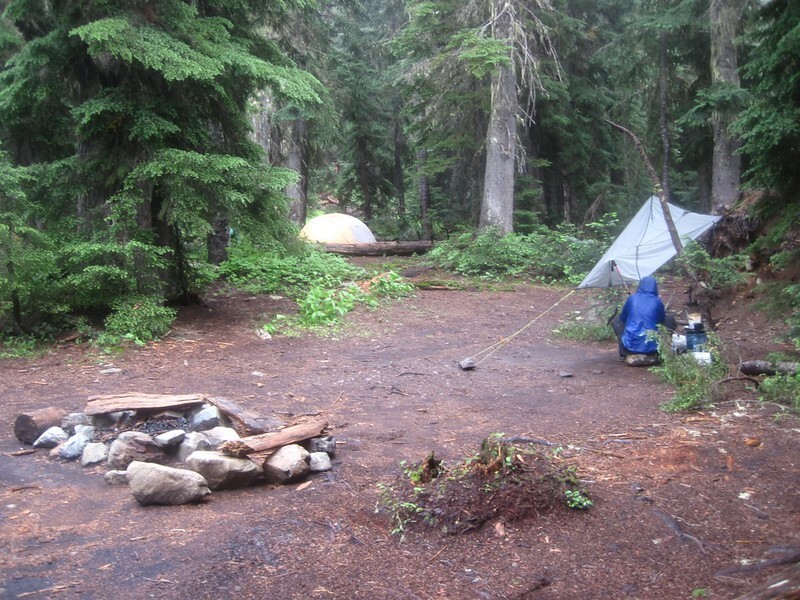 PCT hikers showed up in the dark and stumbled through camp, headlamps flashing around, looking for a flat spot to pitch a tent, or knocked on the ranger’s cabin and engaged in loud talking about the nearest power outlets to charge their electronics (20 miles away in Mazama). We even got a senile grandpa who showed up unexpectedly with headlights blasting into our tent looking for his grandkids who were camped around here somewhere. It was hell, I tell you! I was pining for the peace of the wilderness. So we got up at the barest light of dawn and were already packed and hiking before most people had even crawled out of their tents. Onward! Harts Pass Guard Station from our campsite. 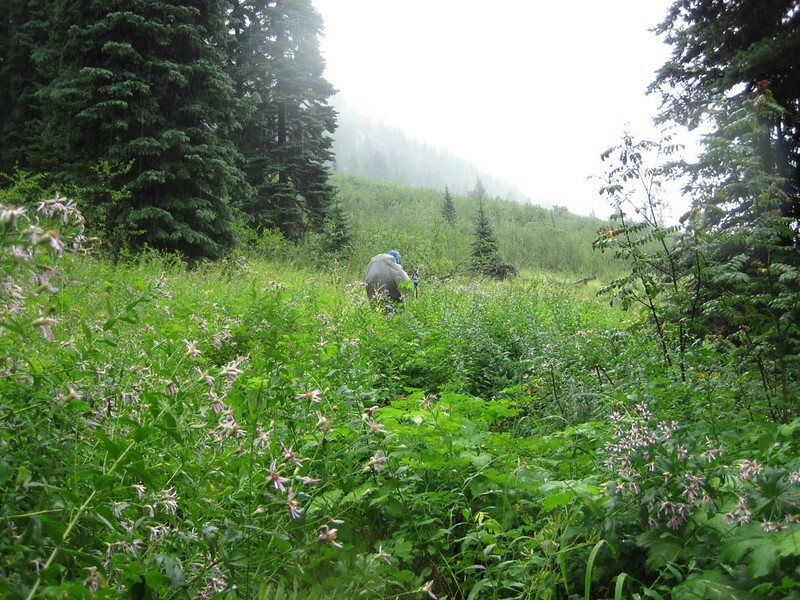 The trail, after traveling through a stand of forest where there was a nice stream, emerged into a high sloping meadow. Once again, we were slogging through wet flowers. But this time the sun came up! The flowers were truly gorgeous everywhere we went. 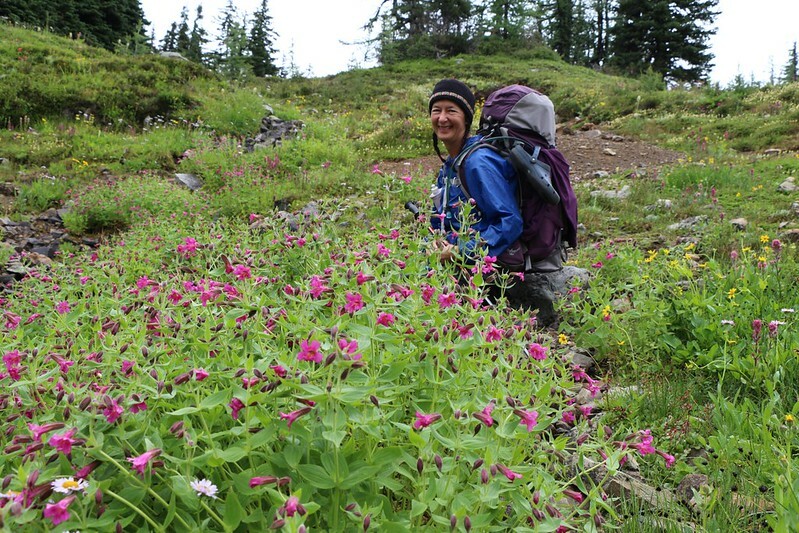 August is a great time to be up in the high country. 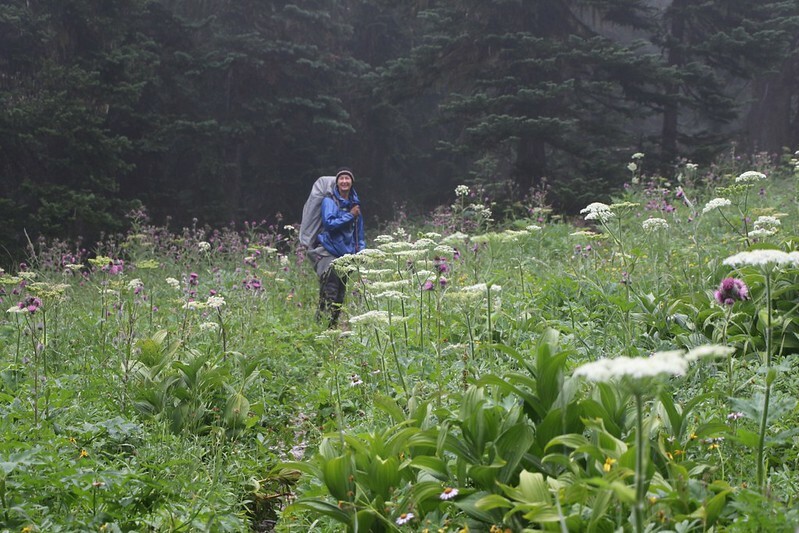 Me, slogging through the wet flowers in the meadow north of Harts Pass. It also looked like today might be the first day with decent visibility! 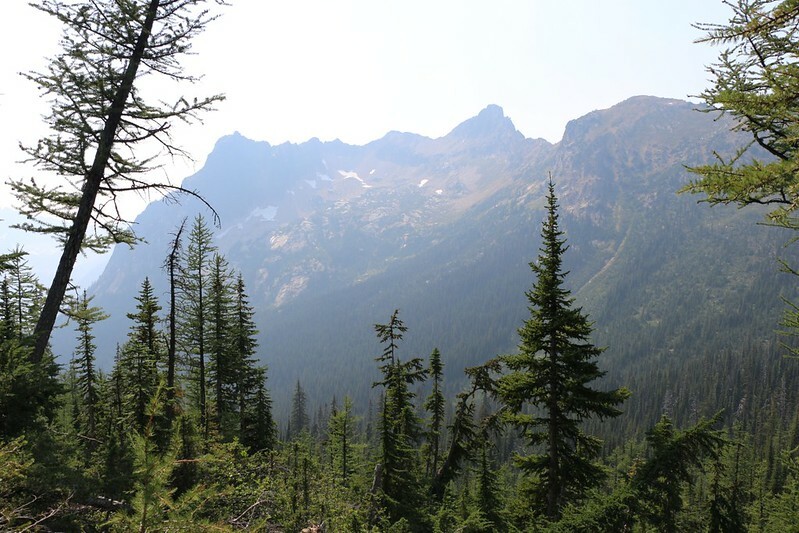 The Golden Horn was visible from the south side of Slate Peak, as were Silver Star Mountain and The Needles, famous peaks from the Washington Pass area on Highway 20. We also saw Slate Peak Fire Tower (elev 7440 ft) up above us. We decided not to climb this peak, even though the views were probably even better than what we were already seeing. There was a dirt road all the way to the top. Zoomed-in view of the Golden Horn from the south side of Slate Peak. Silver Star Mtn, Gilbert Mtn, Reynolds Peak, and The Needles from a mile north of Harts Pass. 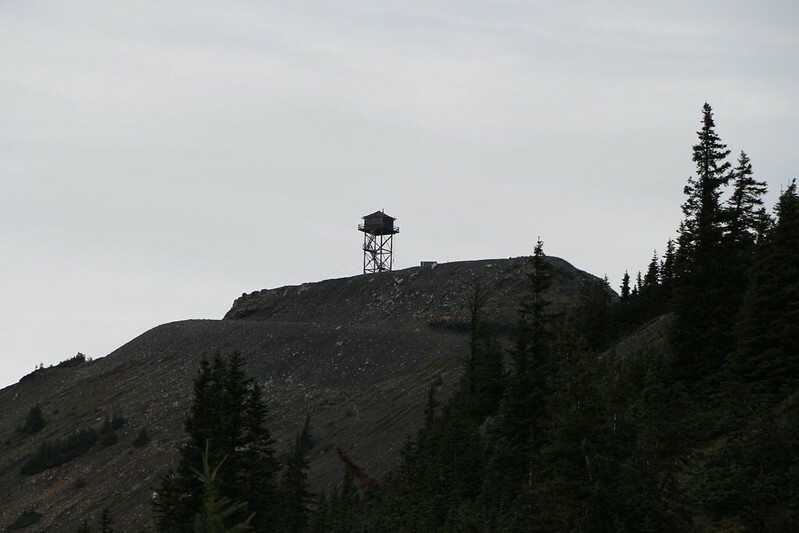 Slate Peak Fire Tower (elev 7440 ft). It’s amazing what bulldozers can do to a mountain when they try. 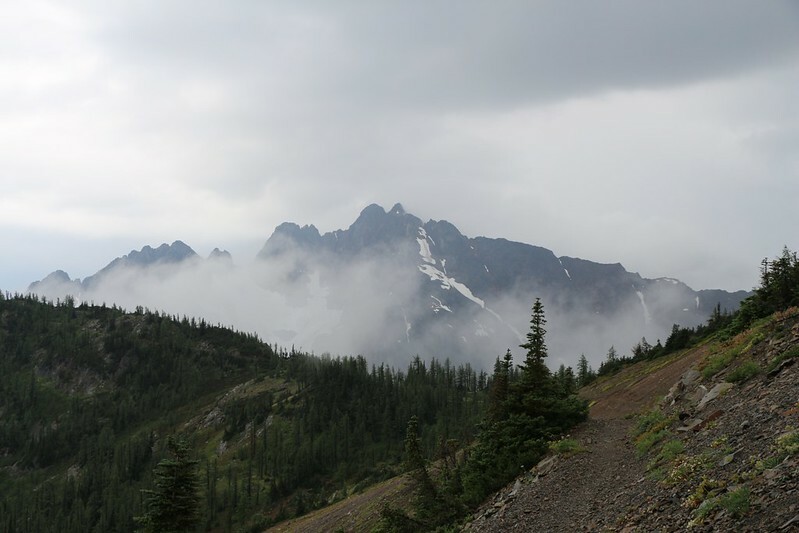 As we hiked over to the west side of Slate Peak, we were able to see Crater Mountain and Jack Mountain not far away, shrouded in swirling clouds and crested with snow and glaciers. 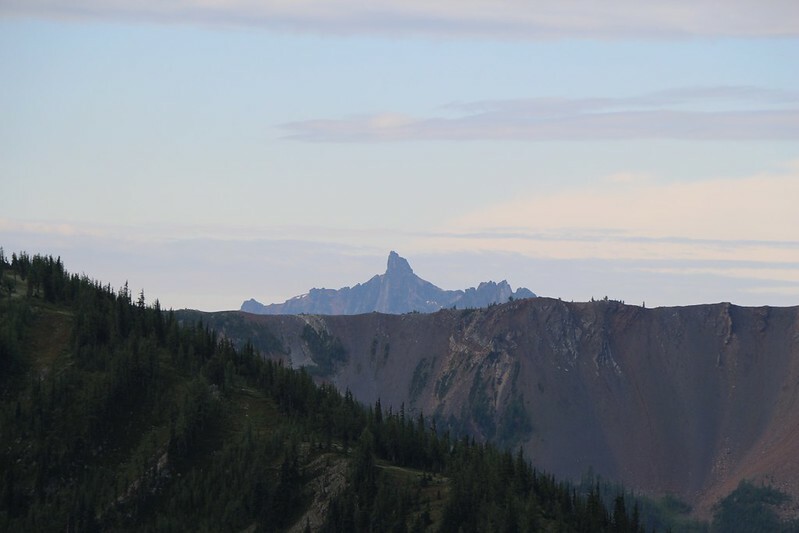 In fact, between the shoulders of these two peaks we were able to see Mount Terror (28 miles distant) and even Mount Baker (10781 ft and 52 miles away)! Visibility was truly great. Now THIS is what I came up here to see! Big mountains all around, looking awesome everywhere. 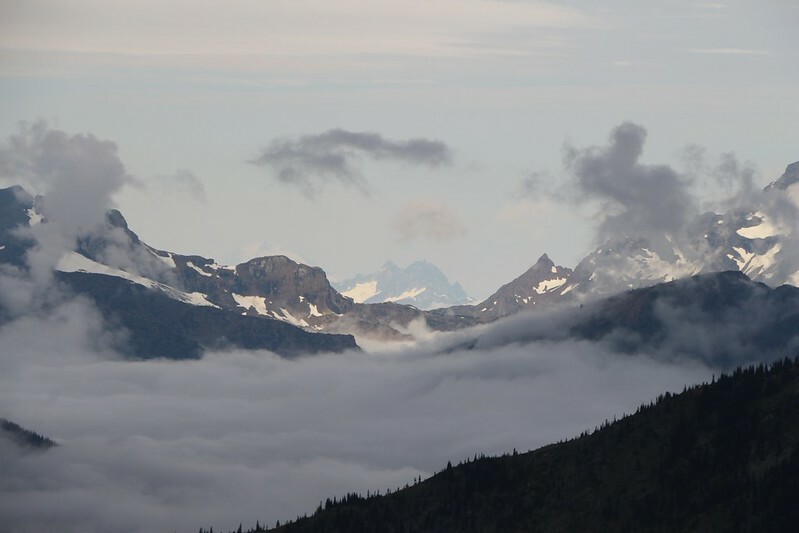 Zoomed-in view of Mount Baker (10781 ft and 52 miles away) barely visible left of center; Mount Terror is in the center. Unfortunately, at this point the clouds began to grow, blocking our distant views, but we were still happy. It was easy hiking along this stretch of trail, and we didn’t plan to hike very far, only seven miles or so. We needed a rest and a chance to dry out after all that rain. 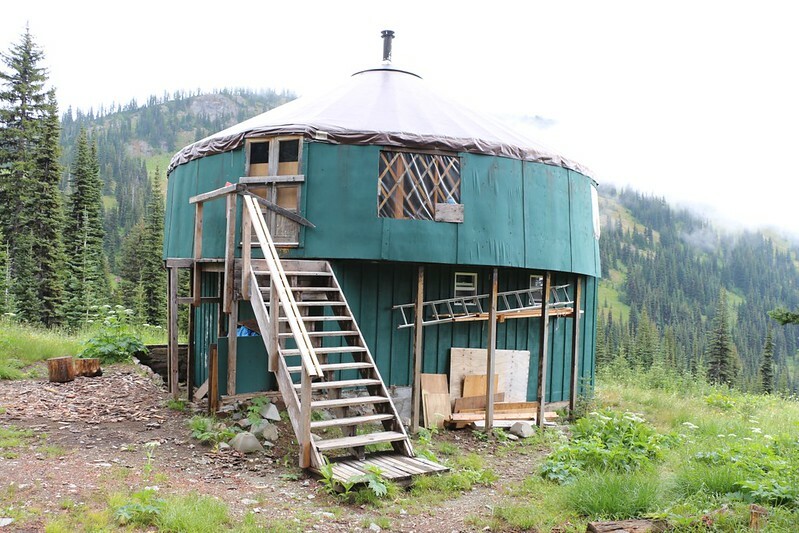 On the way to Windy Pass we saw what looked to be a yurt down in the valley near the old Barron Mining Ghosttown. 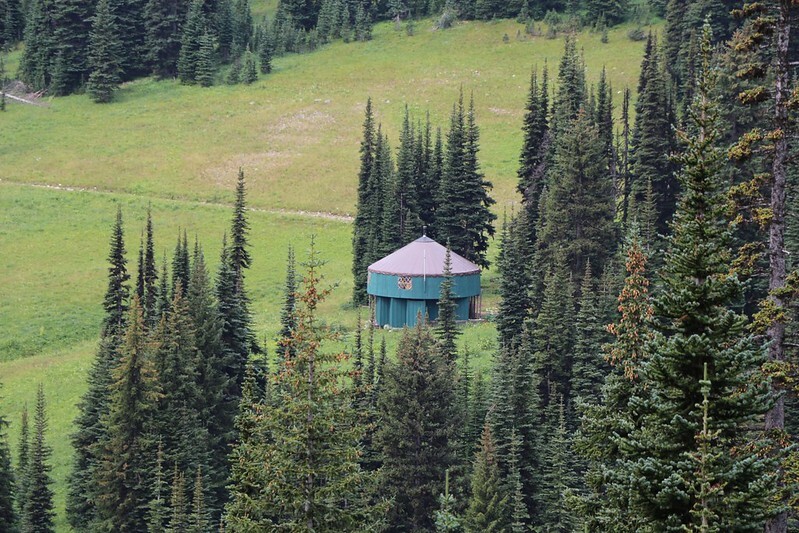 It was painted green and looked out of place out here in what we thought was a wilderness area. But it wasn’t, it was on National Forest Land. Once we got to Windy Pass (and the Wilderness Boundary Sign) I looked on the map and there was a dirt road back to the yurt. I left Vicki to take a nap at the pass and ran down there. 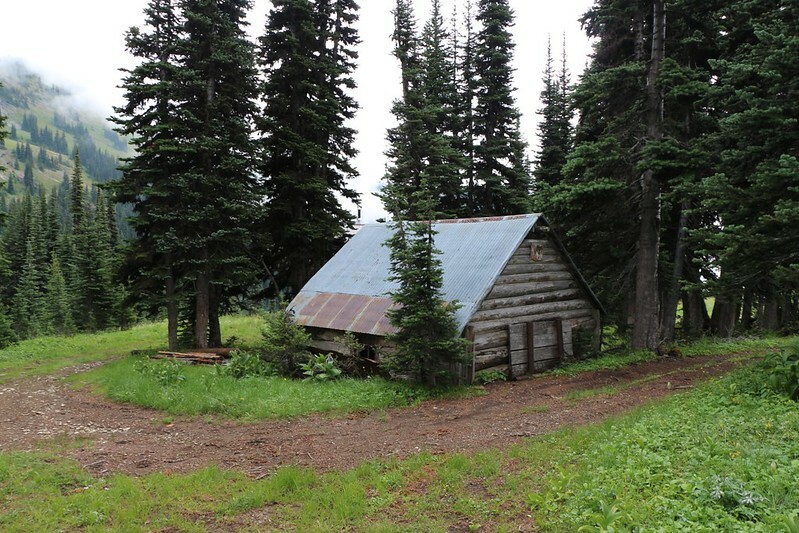 There was an old log cabin from the mining days and the yurt itself was boarded up to prevent folks like me from going inside. I can take a hint. I took a bunch of photos to show Vicki later when we got home. 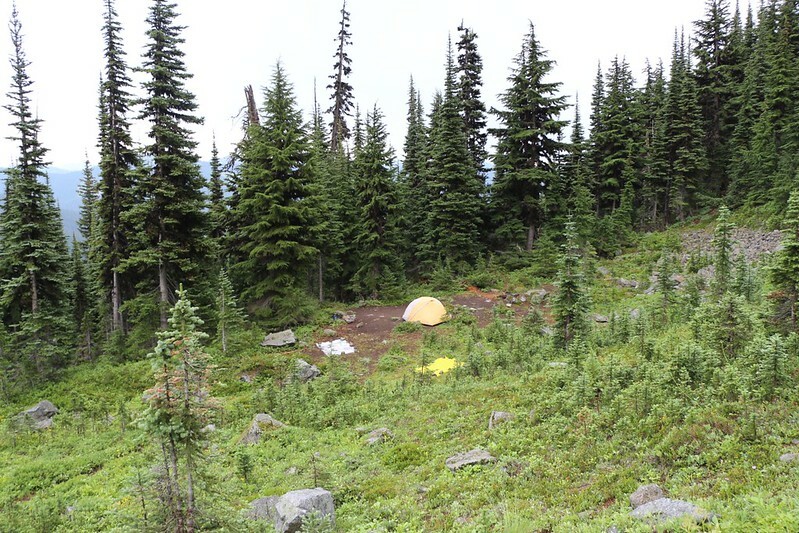 Not long after, we hiked into the WACS2636 campsite (WAter CAmpsite mile 2636) and set up camp in the less obvious of the two available areas. The main one was too close to the trail, and someone might show up late at night, waking us, as had happened at Harts Pass. We dried out our tent prior to setting it up. We also did some laundry, and hung everything out to dry. A few drops of rain sputtered down afterward, but we didn’t really care. Then we relaxed in the tent for the rest of the afternoon, reading and napping and generally enjoying ourselves. We deserved it! Drying our tent at the Windy Pass campsite. A dry tent and drying laundry. Dry at last! This was to be our final day on the PCT. 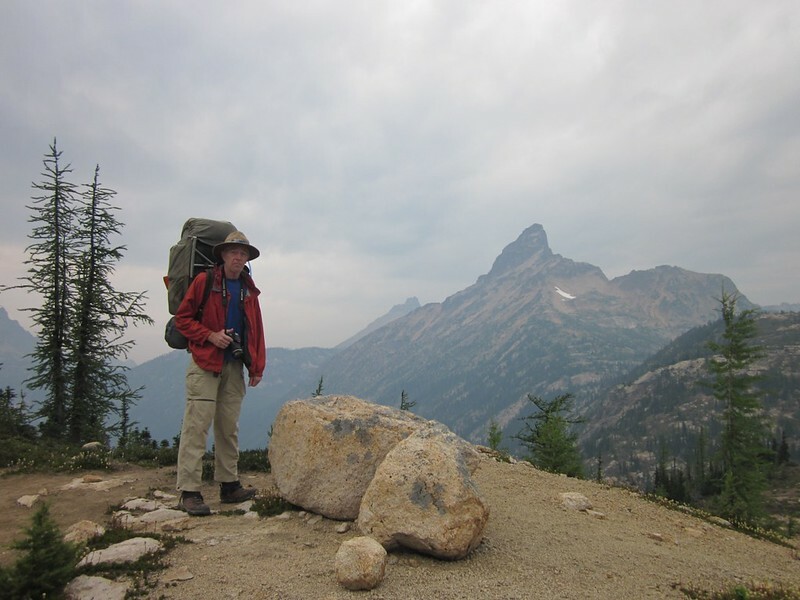 We’d met several through-hikers heading to the Canadian border, and we were a bit tempted to see it ourselves, but we had a boat to catch on Ross Lake, and so we were determined to turn left at Holman Pass onto the Devils Dome Trail. When we woke, we were completely inundated by fog and mist. No great views for us today. Maybe if we were lucky it wouldn’t rain. And August was supposed to be the least rainy month up here in Washington. Sheesh! I’d hate to be here in the rainy season! My shoes still hadn’t dried out, and my toes were all wrinkled at the end of each day. Luckily we were prepared, and so we survived just fine. And the woods are still beautiful even in the mist. In fact, Vicki was, once again, very happy that it was misty and cool for the uphill sections. That’s a silver lining, if ever I heard one. A misty morning at the Windy Pass campsite. This spot is called WACS2636 by the PCT folks (WAter CAmpsite mile 2636). Only 24 miles to Canada from here. 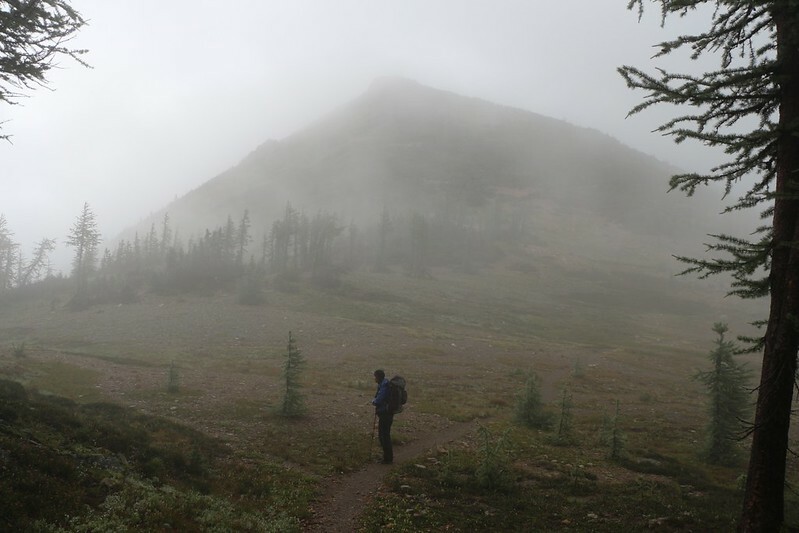 We hiked up to and along a ridge above the campsite, where the mist was all around us. Very nice. It would have been nicer to get a distant view, but we can’t control the weather. On the way down the other side we suddenly heard bells ringing. Bells! And we both looked at one another, as we’d heard such bells before. They must be on horses! 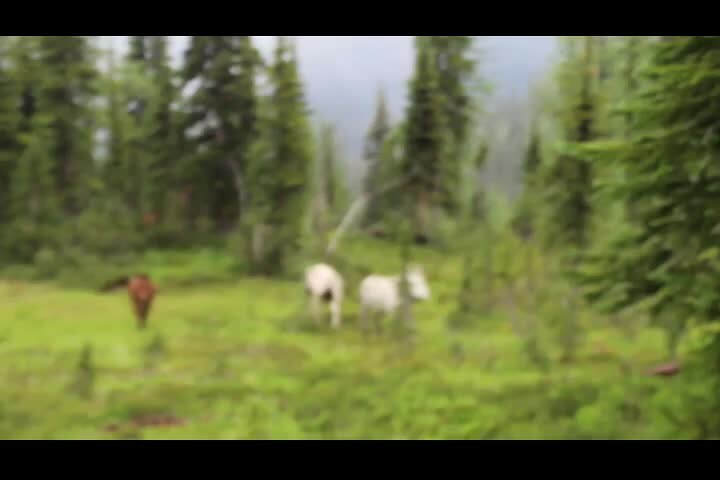 Vicki’s face lit up, and then we saw them, three horses, all wearing bells, walking along the trail together in a line on the way up to the ridge. They had no saddles, no packs, and no tack of any kind. Just bells. And no humans! 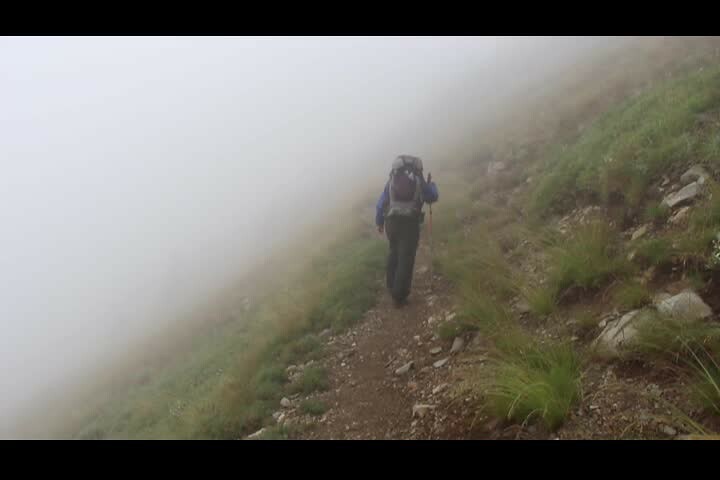 We took photos and videos as they walked past us, onward and upward into the fog above. What a wonderful mystery. 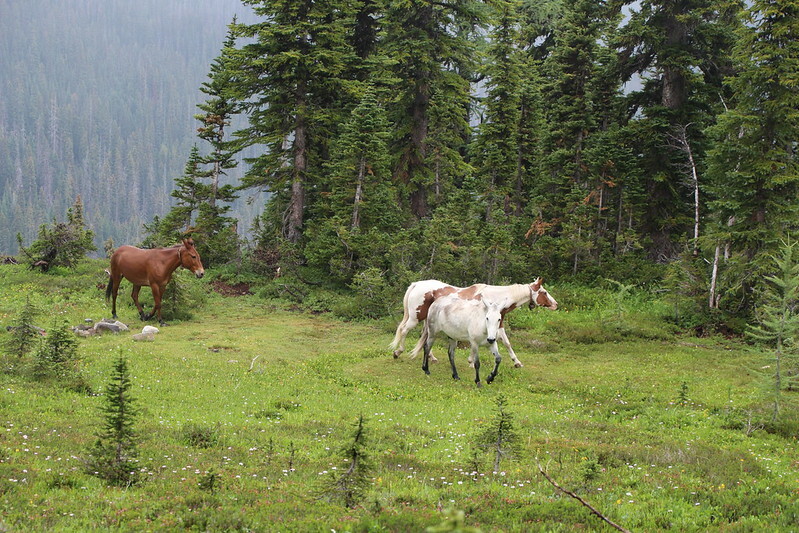 Belled Horses enjoying a walk home together on the PCT north of Tamarack Peak. 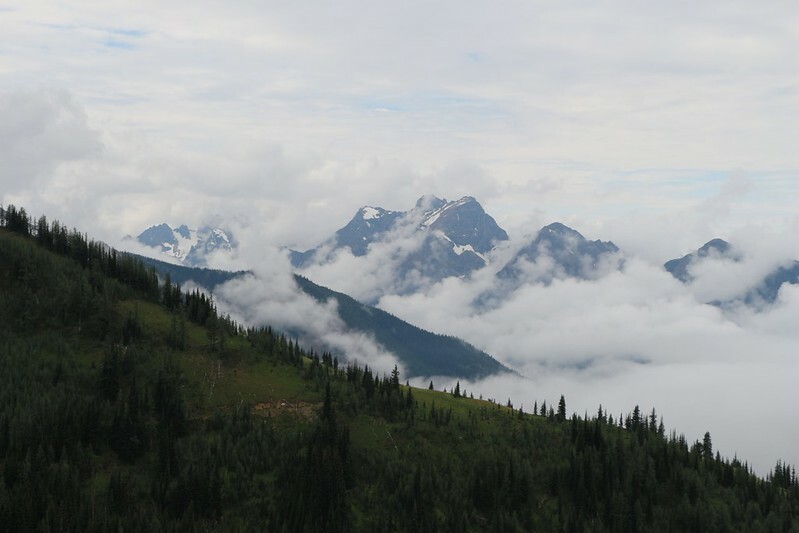 We hiked on, over Foggy Pass and on to Jim Pass. They were both Foggy to us. 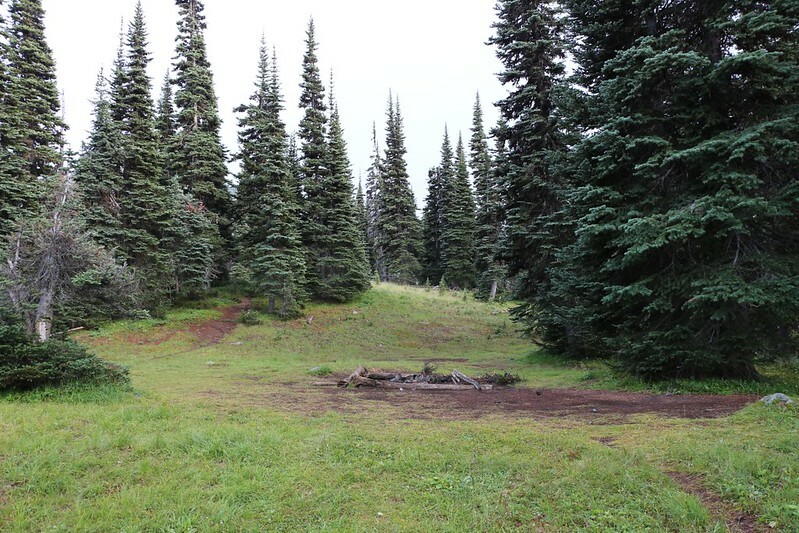 There were several nice campsites along the way, and also a few patches of blueberries. We snacked on them as we hiked. We met up with the horses’ owner several miles further along the trail. He’d stopped riding his horse to give it a rest at the top of the Devils Backbone section, near Jim Peak. He said “Oh yes, they got tired of being out here and decided to head on back by themselves.” He didn’t seem to be worried. They obviously knew where they were going. 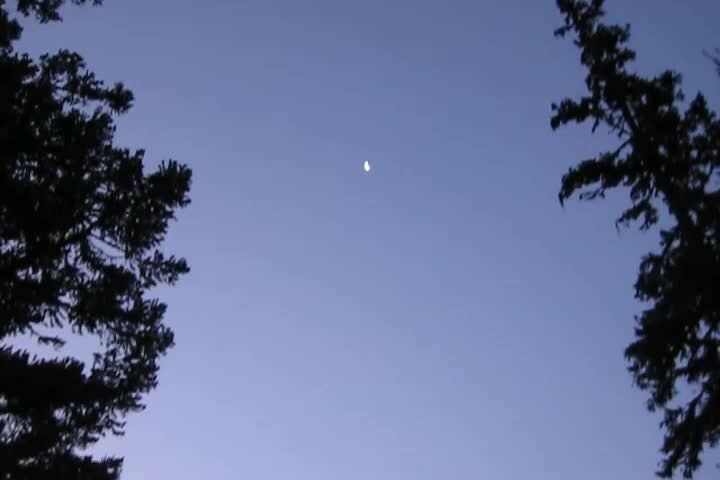 He also gave us a tip on where to camp that night, a couple of miles beyond Canyon Creek (where we’d intended to stop). We thanked him and hiked on. I wish I knew his name, in order to thank him again, as he gave us some great advice. Peak 7058 of the Devils Backbone and Jim Peak in the clouds, as we make our way downhill toward Holman Pass. 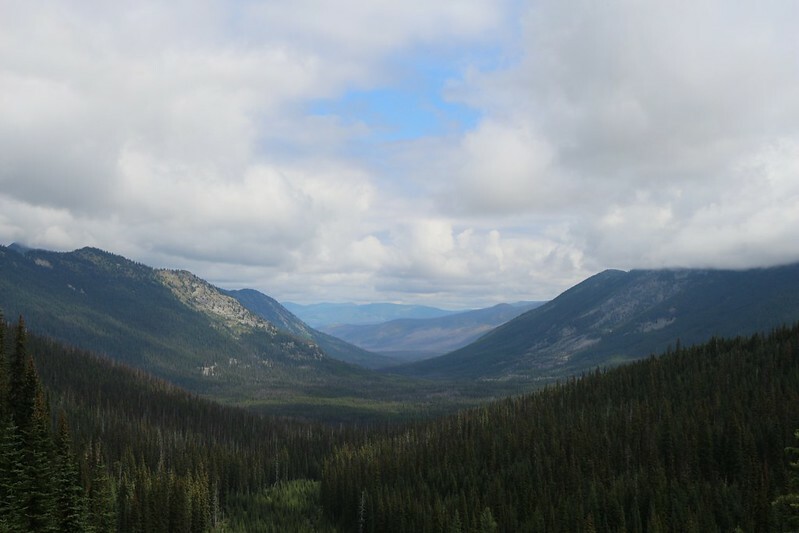 Okanogan Range in the distance, with Buckskin Point on the right. That’s the West Fork of the Pasayten River down below. After descending along the Devils Backbone, we took a rest, filtered some water, and made our way downhill toward Holman Pass. It was a long and easy trail until the very end when it switchbacked down the final slope. We got to the trail junction at Holman Pass and took a nice rest. The PCT continued straight north, to the right was the trail down to the West Fork of the Pasayten River, and to the left was our new trail, the Devils Dome Trail. Goodbye, PCT! It was 16 miles to Canada and 44 back to Rainy Pass where we’d started. We hiked down this new trail toward Canyon Creek, and we could tell right away that this trail didn’t get much foot traffic. At all. Or much maintenance (and money). 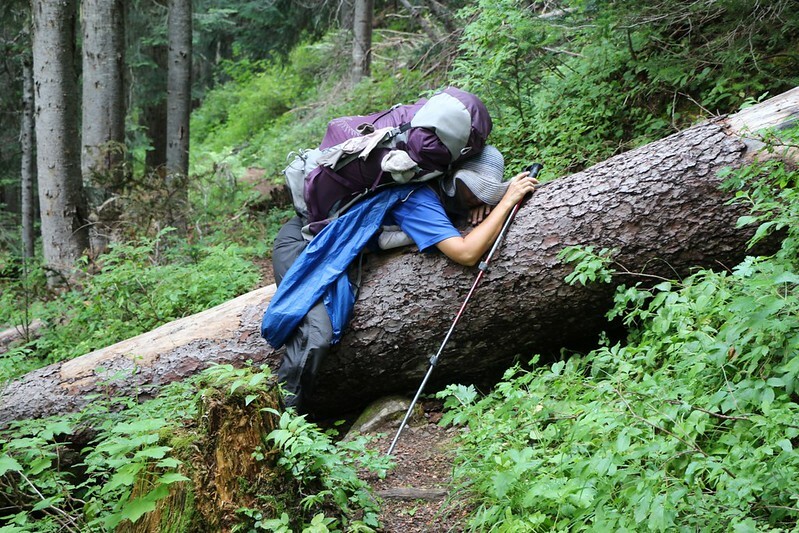 The PCT was a regular superhighway by comparison. We were stepping on grass, not bare dirt. On the way down we passed a really large PCT-ish campsite, and also an old metal-roofed miner’s cabin that was collapsing back into the earth. Eventually we ended up at Canyon Creek, which was running nicely. This was where we’d intended to camp originally. And it was a nice enough spot, but there weren’t any views and it looked like it would be “Mosquito Heaven” as evening set in. We took a short rest, filtered some water, and decided that we had enough energy to hike onward, uphill to the unknown campsite. Canyon Creek where it crosses the Devils Dome Trail. It was a tough trail. Steep in spots, and with several blowdown trees blocking the trail that we had to climb over, crawl under, or bushwhack around. Vicki was getting really exhausted and overheated as we climbed. It was hot and sunny out, and some sections of trail aimed directly toward the sun so there was no shade whatsoever. It wasn’t easy, but we took our time and eventually made it to the small stream that the horseman had spoken of. 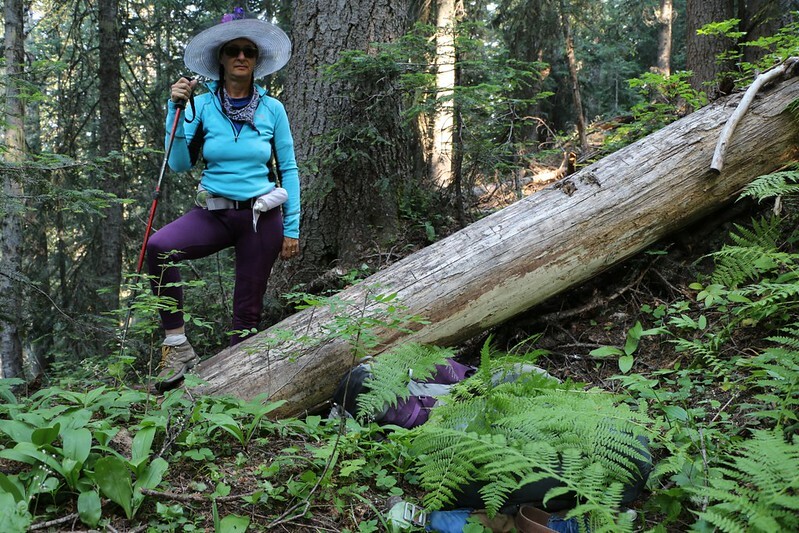 Vicki stopped right there on the side of the trail, napping on a big log, and I walked off to the right on the small side trail he’d mentioned. And after less than a quarter mile, I found the campsite. He was right! It was beautiful! There was a small stream of water just off to the left. And the campsite itself was just below some tall pines, with a nice flat area for the tent. There was a fire ring, too, but we didn’t care about that as fires were banned this year. I put down my big pack and walked back to get Vicki. She wanted to camp right there where she was, she was so tired, but I convinced her to walk a bit further. I even carried her backpack, which helped a lot. Once she saw the place she got much happier. 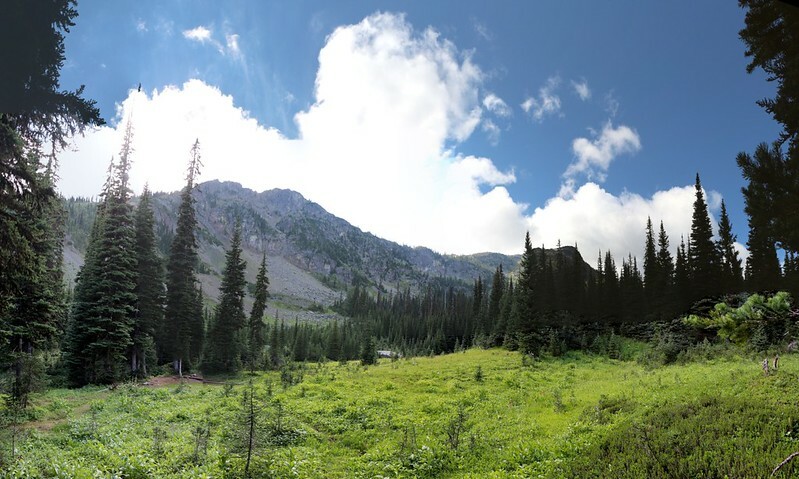 There was a big meadow, a nice view of a mountain, and the stream was right there. Perfect! Vicki recovered quickly after that. We opened up the tent and let it dry completely. Then we went and filtered some more water for dinner and breakfast. And then Vicki did another round of laundry while I wrung everything out and hung it to dry on our makeshift clothesline. And believe me, after all the sweating we’d been doing, it was high time! We left it out in the breeze to dry overnight, had some dinner, and slept the sleep of the righteous. Campsite and a meadow below Peak 7791 just off the Devils Dome Trail. The next day dawned foggy and misty again. We were starting to get used to this weather by now. 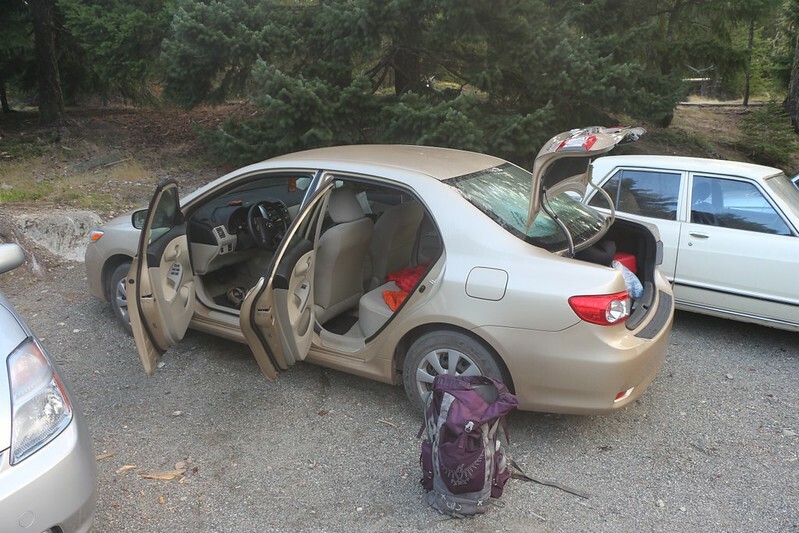 We packed up and started hiking, headed for Sky Pilot Pass, Deception Pass, and Devils Pass. 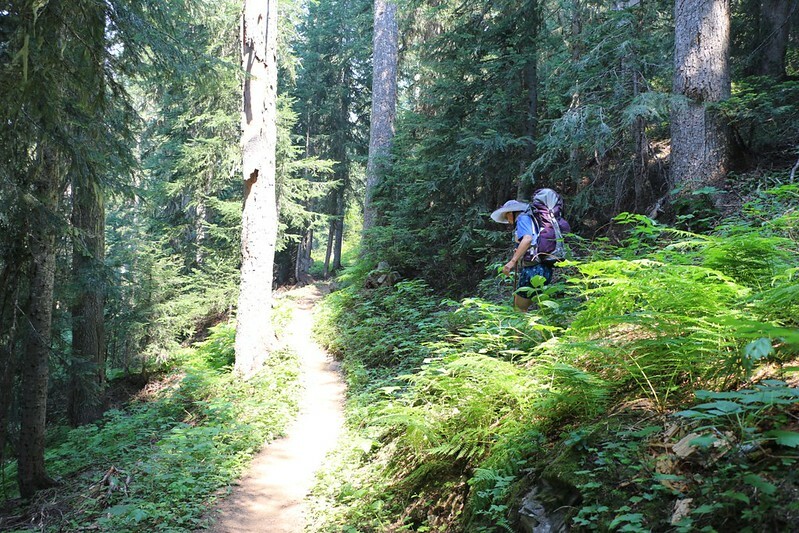 The trail paralleled Canyon Creek but stayed far above it. 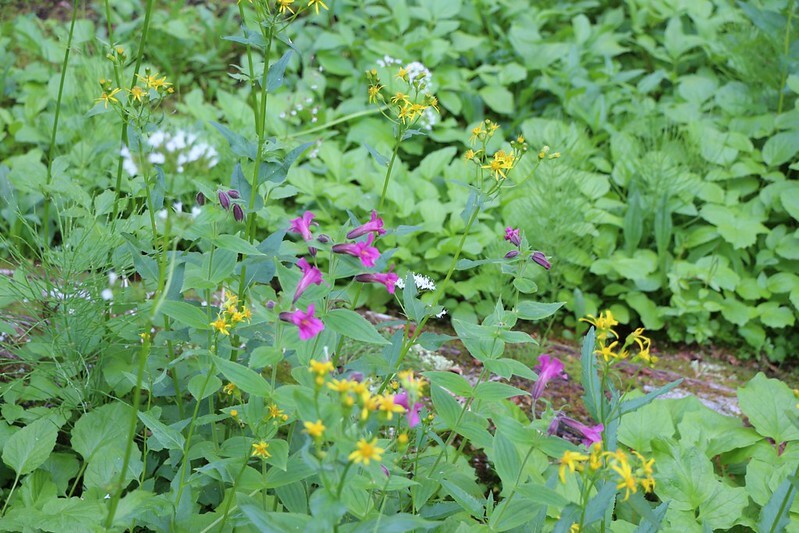 There were many high sloping meadows filled with wildflowers. And then the fog burned off and the sun came out. Hooray! We were finally getting the nice weather we’d been waiting for for so long. 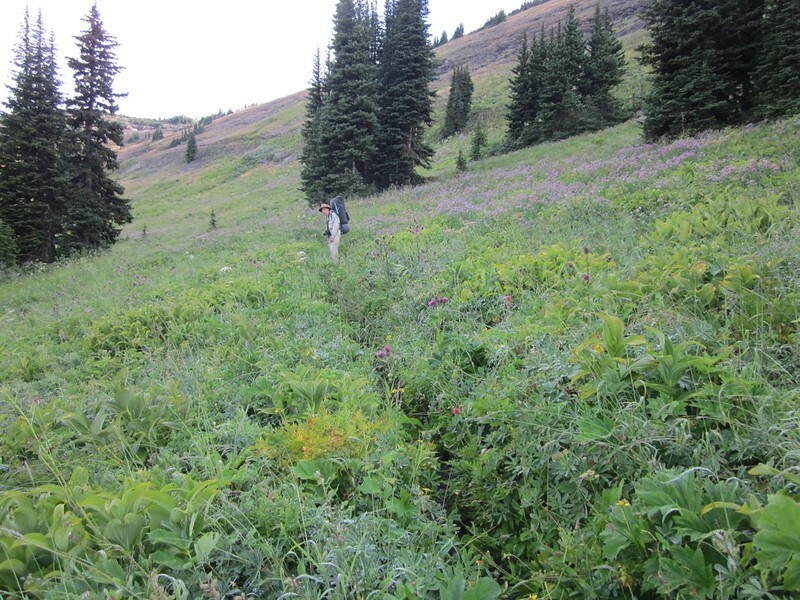 Me taking a photo of the flowery meadow above Canyon Creek on the way to Sky Pilot Pass. We climbed up and over Sky Pilot Pass. On the way down the trail switchbacked through more high meadows, and provided lovely views to the west, of Jackita Ridge, Jack Mountain, and Devils Pass (our destination). What a beautiful day. Jackita Ridge, Jack Mountain in the distance, Devils Pass (our destination), and Peaks 7203 and 7514 from the trail just beyond Sky Pilot Pass. Once down below and into the forest again, there were a number of old, rotting wooden trail bridges that were built in order for horses and hikers to traverse a flat swampy section of trail near Deception Pass. 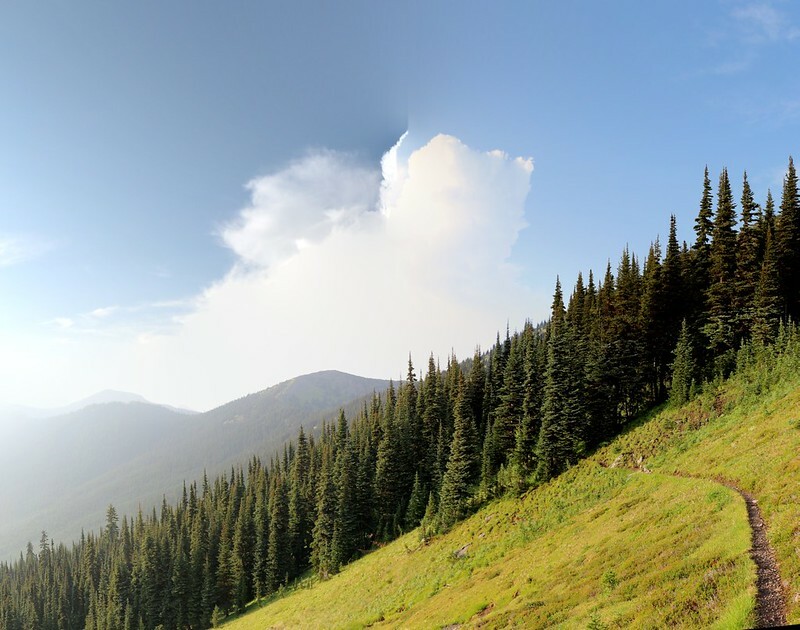 The trail rose back out of the pass and began a long horizontal traverse toward Devils Pass. 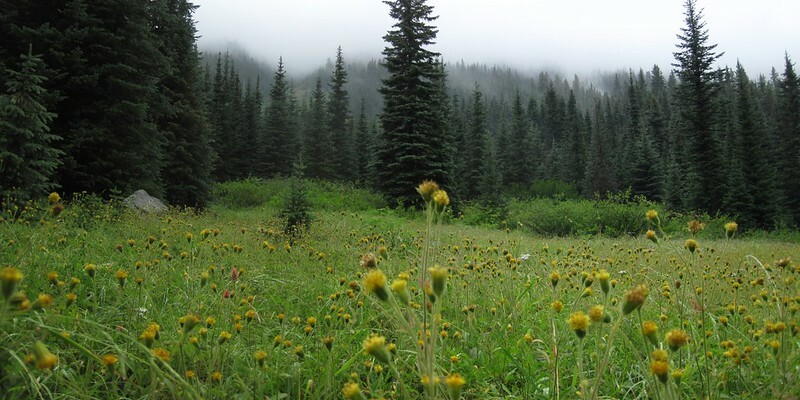 There were more high meadows and even more wildflowers. How many photos could I take of them? Rotting wooden trail bridge over a swampy section of the Devils Dome Trail near Deception Pass. 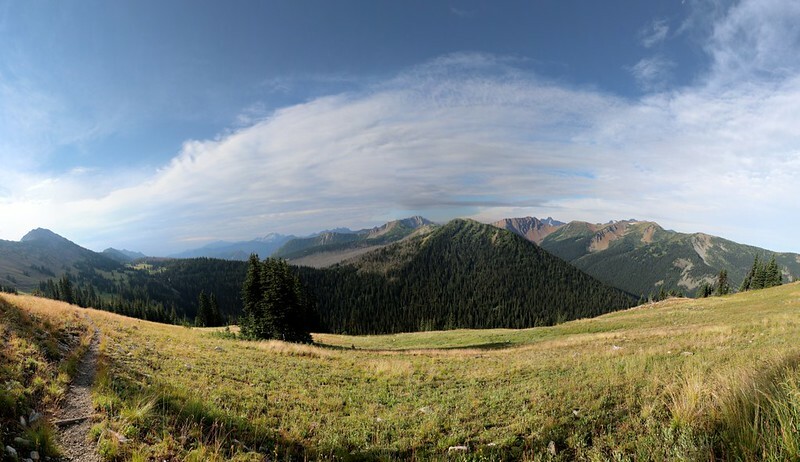 Meanwhile, a medical issue, not immediately life threatening (which I would prefer not to discuss in any detail here on the internet) arose as we were hiking, and so we made an early camp, a mile or so before our planned destination at Devils Pass. We made ourselves as comfortable as possible in the tent and rested while we planned out our next moves. Our campsite on the trail northeast of Devils Pass. Generally speaking, we realized that we were going to have to end our hike right away. Spending three more nights and catching the boat at Ross Lake was not going to happen. We really needed to exit the wilderness immediately. But we were, essentially, about as far from civilization as it was possible to be on this hike. So we got out the map and started looking at our options. Heading for Ross Lake was shortest at thirteen miles, but then we’d have no boat ride scheduled, so we might have to hike another thirteen miles to the highway. Hiking back the way we’d already come was about twenty miles to Harts Pass, but we’d still be twenty miles from the main highway, on a dirt road with little traffic. 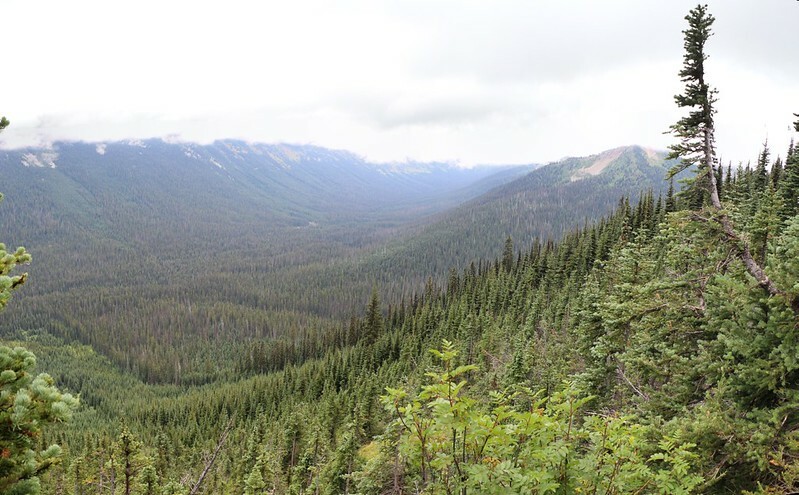 The obvious route was the Jackita Ridge Trail, which was about seventeen miles to the highway. All three routes also required hitchhiking back to the car at Ross Lake. As we were getting ready to leave (still inside the tent), a late afternoon thunderstorm arrived. It was pouring down, and lightning and thunder were booming all over the mountains. 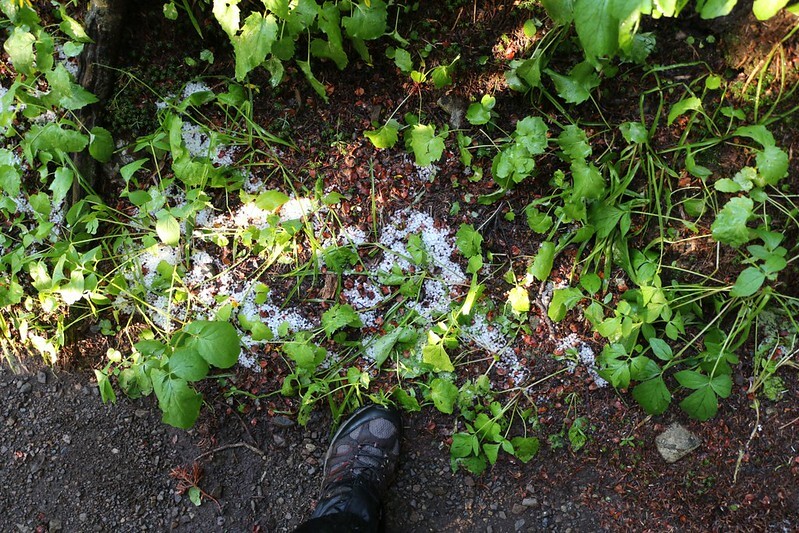 There was even a bit of hail. Once again, it was sure nice to be dry inside a tent in the rain. So we stayed inside and waited it out. 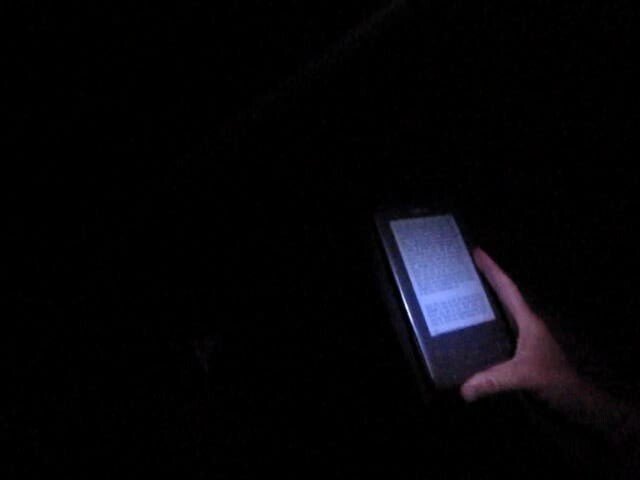 Then we got ready for the ordeal that was ahead: Hiking out to the highway, all night long, in the dark, on an unknown trail. I’m calling it “Day 8” even though it actually started on Day 7. It ended on Day 8. It sure felt like another day. And then some. I put fresh batteries in the GPS and checked the onboard map. I hadn’t pre-loaded any special tracks for the Jackita Ridge Trail, but the trail itself was on the unit’s basic topo map, so life was good. We were wearing our raingear, as everything was wet after the rain, and, who knows, it might rain again. We also made sure that our headlamps were ready, as we’d be needing them that night. The two of us were nervous, but we knew that we had made the right decision, and then we got on with it. It was six PM. There were a couple more hours of daylight left, and we wanted to make the most of them. Soon enough, we arrived at the campsite at Devils Pass where the Jackita Ridge Trail intersected the Devils Dome Trail. This is where we should have been camping that night. And it was a pretty nice place to camp. 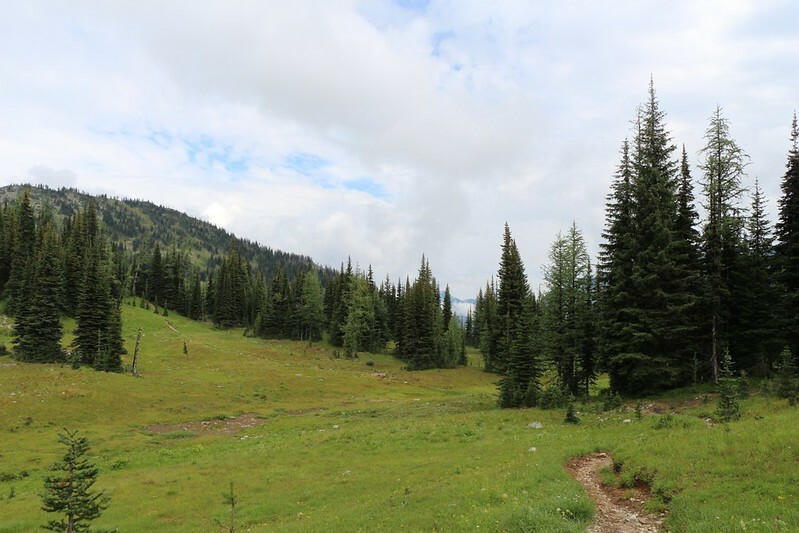 I took some photos and hiked onward, south toward Jackita Ridge. 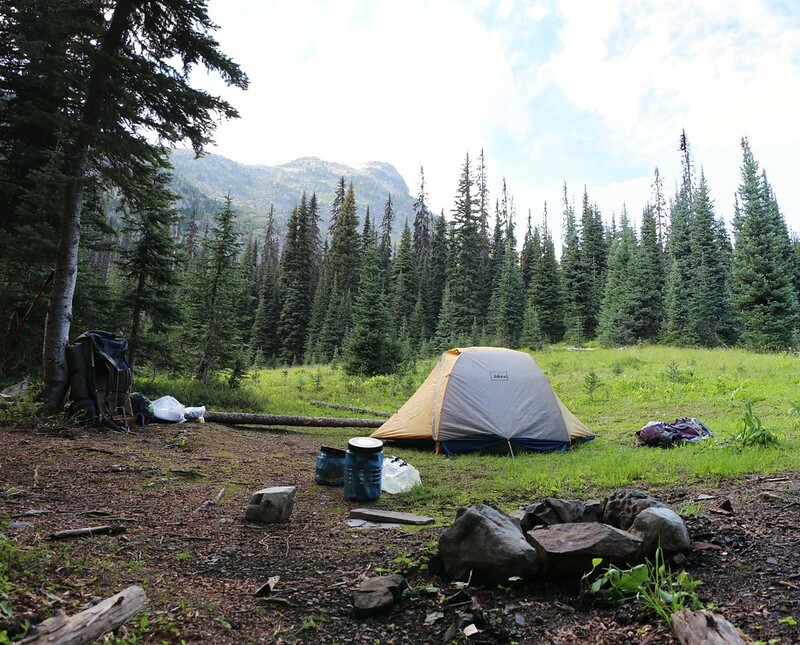 The campsite at Devils Pass on the Devils Dome Trail. This is where we should have been camping that night. Looking back. 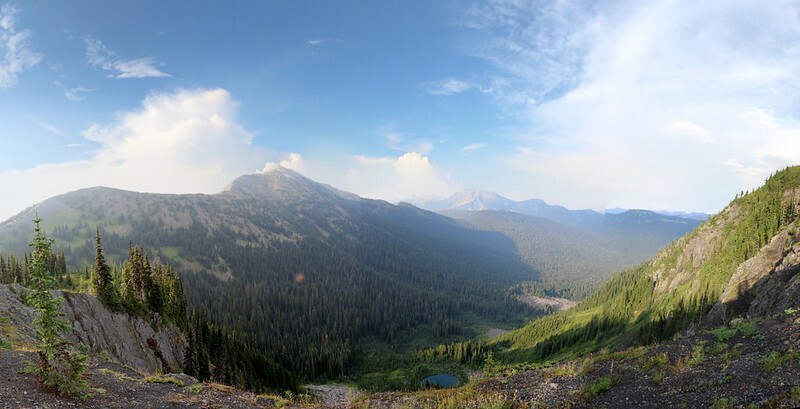 Panorama of Peak 7514 and Shull Mtn above Lake 5644 from the Jackita Ridge Trail. Devils Pass is downhill on the left of the photo. The first five miles of the seventeen mile extravaganza were nice and easy. Flat for miles, then downhill toward the crossing of the North Fork of Devils Creek. Along the way were more high sloping meadows full of soggy flowers, with the usual result: Soggy Toes. 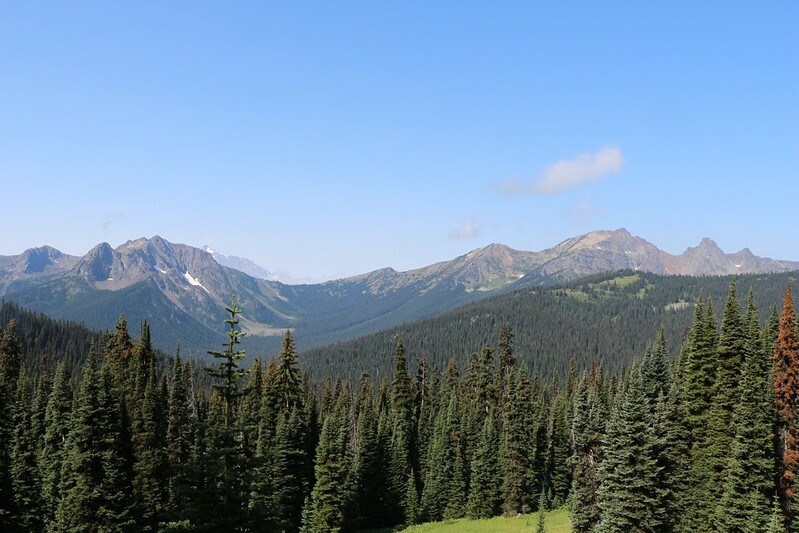 However, the nicest parts of the hike were the views west toward Crater Mountain and Jack Mountain. These were serious peaks, with their own glaciers, and they looked awesome as the sun set behind them. Zoomed-in view of the northeast face of Crater Mountain. 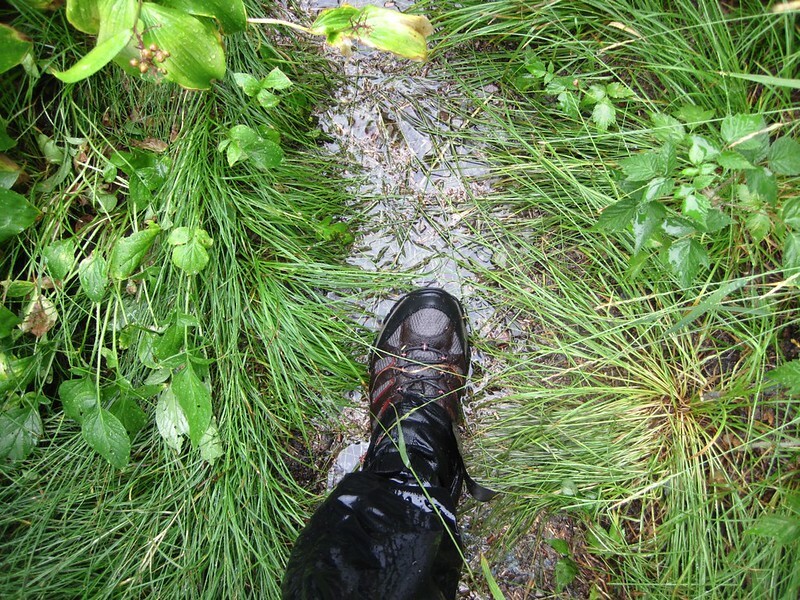 Wet trail conditions on the Jackita Ridge Trail near Anacortes Crossing. I didn’t look, but I could tell from the squishiness that the skin on my toes was, once again, a bit wrinkled at this point. 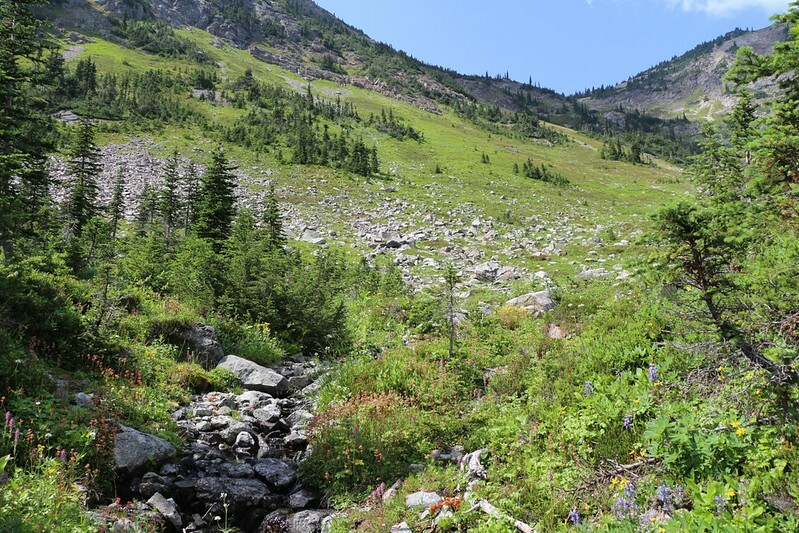 Little did I realize, but after the trail descended past Anacortes Crossing (thus losing our precious elevation), it then re-ascended up and over one of several ridges that jut outward from the main spine of Jackita Ridge. On the way down I spoke with some Boy Scouts who had camped along the trail. One of them said, after hearing about our route and our plan to hike all night, “Oh man, it’s unbelievably steep, and it’s EIGHTEEN MILES back to the cars!” This didn’t make me happy at all. 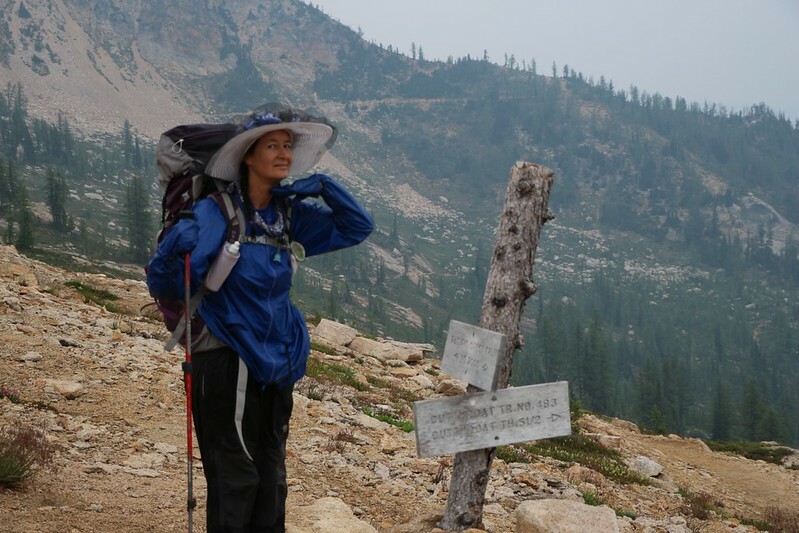 I’d calculated seventeen miles total to the road, and we’d already hiked five of them! Six miles EXTRA? I was not amused. All I could do was hope the scout was wrong. He was pretty young, too, and not all that credible; if one of the older scouts with a GPS and a map in his hand had said it, however… But it didn’t matter. We HAD to hike it. So hike it we would. Twelve miles more or twenty. Anacortes Crossing on the left, and Jackita Ridge, center. We filtered water in the stream where the trail crossed, as it was still light enough. Also, earlier, it had looked on the map like there might not be another stream crossing for several miles. Water from here was part of the plan. Plus we really needed a rest. Sitting at the stream, filtering water, was nice and peaceful. Our feet were soaking wet from all the grasses and flowers in the high meadows near Devils Pass, but that was OK. We weren’t cold, and we still felt strong. We could do this. The sun went down as we got started up the trail. It climbed extremely steeply back up to the high ridge we’d seen earlier. It was a very tough climb. 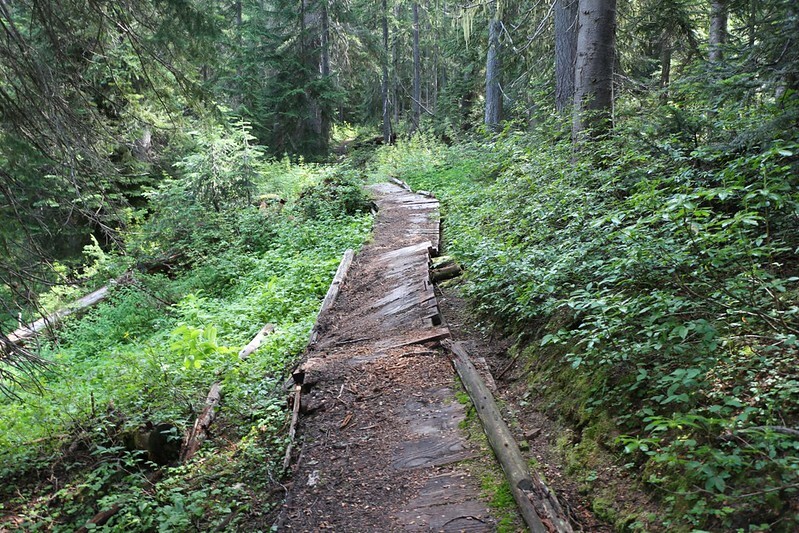 So far, that Boy Scout was right: This trail was evil! It hadn’t been maintained, and there were head-high bushes and trees that we were forced to push our way through. 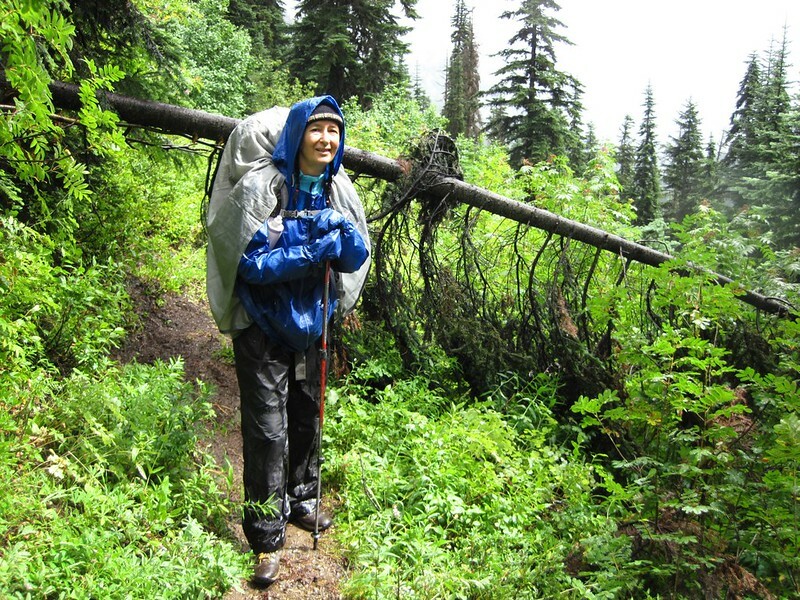 All of them were coated in raindrops, which soaked us clear through our old goretex raingear. We pushed branches out of the way as we climbed, scrambling up over bare roots and water-eroded boulders, our heads bowed low so that we could see the trail below us in the light of our headlamps. At least we thought it was the trail; it was more like an insanely-steep water-gully. But the GPS was firm in declaring that we were on the right track. We were sweating so much that it was hard to know where the main source of sogginess came from: The bushes or ourselves! Finally, we topped the ridge and the trail gently descended for a mile or so, providing some needed relief. There was no moon, but even in the light of the stars we could tell that there were amazing views from here. If only we could enjoy them! We could barely make out the dim silhouettes of Crater Peak and Jack Mountain to the west. The Milky Way was above us, uncaring and aloof in its majesty. 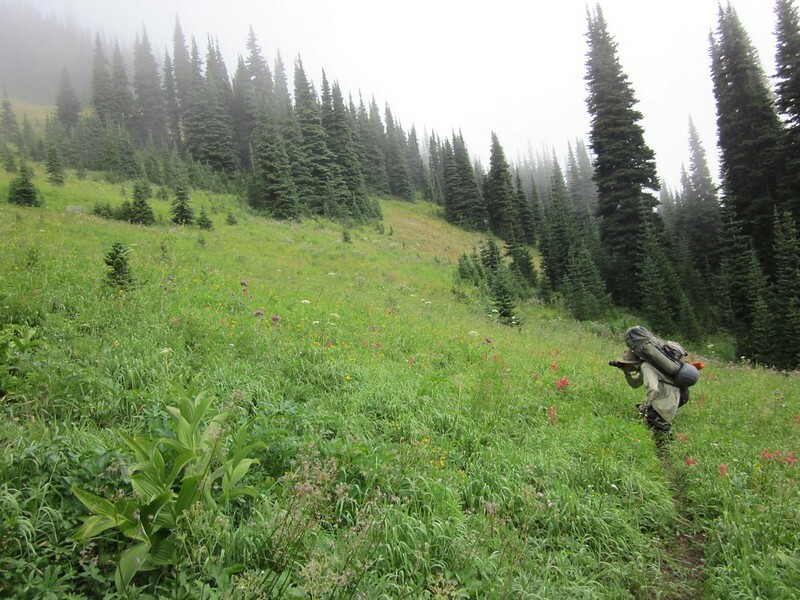 Closer to home, we could tell that we were traversing the side of the mountain, along yet another high sloping meadow full of wildflowers. Some of the plants seemed reflective in the light of our headlamps, or maybe this was merely due to the sparkling droplets of rainwater that had beaded up on their leaves. And, in truth, the small radius of headlamp light was all the world that mattered to us, the thin winding track leading us downward. We were losing, once more, some of the hard-won elevation of the previous evil section. Meanwhile the air was getting colder. 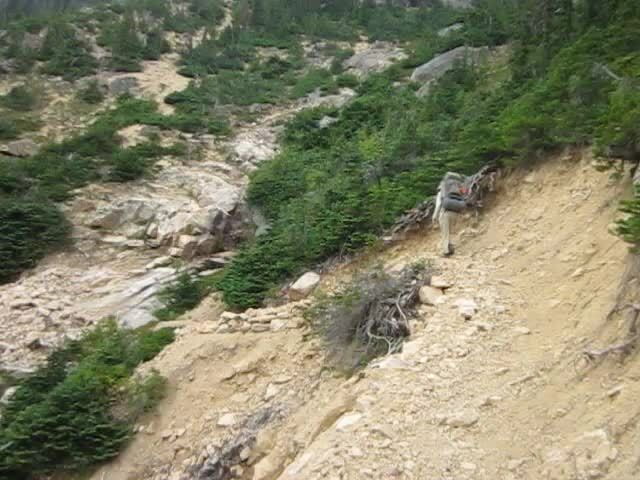 After that the trail became utterly evil again, as we climbed a bare scree slope for what seemed like forever. The gravel of the slope was wet, which helped in that it didn’t slide much, but it also made it difficult to tell where the trail was. 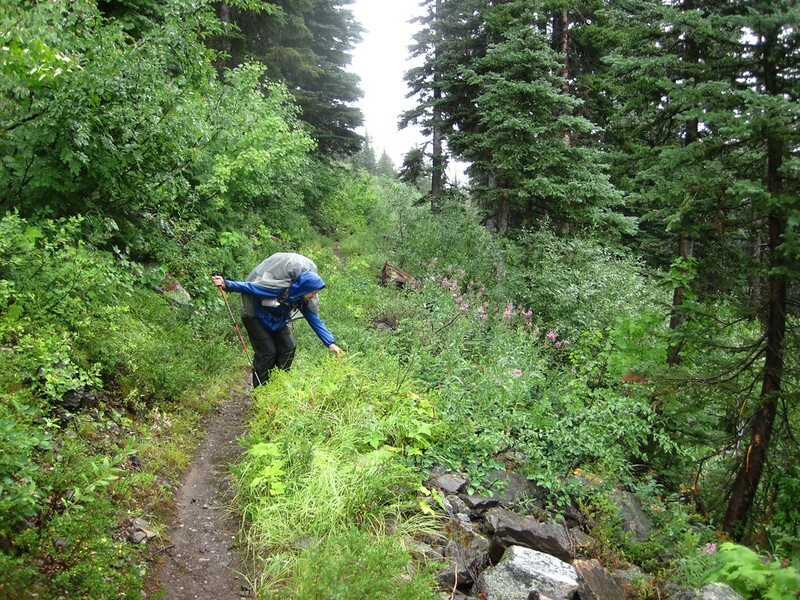 Sometimes the trail switchbacked, and then we had to negotiate washed out sections. Other times it went straight up a steep ridgeline. In still other sections we may have been off-trail entirely, and were simply following the track of someone else who had been equally lost. We’ll never know. The trail climbed higher and higher and higher. 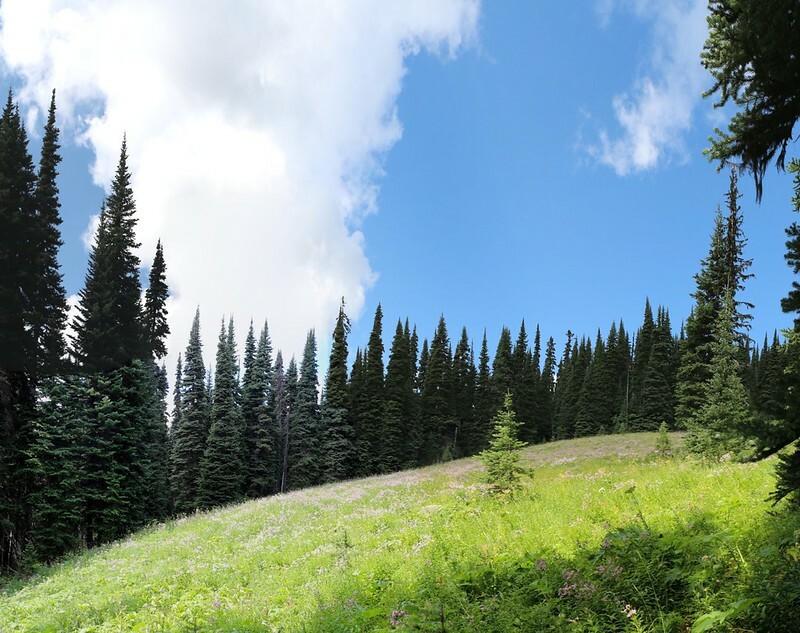 The GPS said that we were up near the treeline at 6800 feet elevation. We were totally exhausted by then, but everything was wet, including ourselves, and we didn’t dare stop or we’d freeze. Not that there were any flat spots to be found. 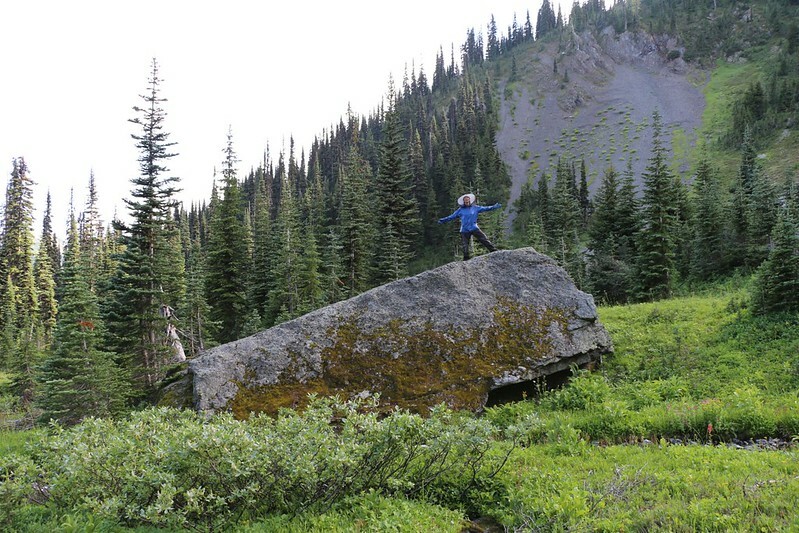 Just an occasional boulder that really only had sitting room for one. So we kept on hiking. We could only stop and rest, standing up, for very short periods before the cold crept back in. You have no idea what a relief it was to get to the top of that evil slope! I would have whooped if I’d had the strength. We stood and breathed and gazed around us with our headlamps off. There were no lights anywhere, not the faintest trace of civilization. We were lucky that it was relatively calm or the wind chill would have frozen us. It was so quiet that we could faintly hear a stream tumbling over rocks far, far below us. We turned on our lights and started hiking because we had to. The trail sloped gently downward and we made good time. We had to walk fast to keep up our body heat. As I checked and re-checked my GPS to make sure we were still on the right trail, I kept noticing something up ahead called “Devils Park Shelter.” Shelter! Exactly what we needed. As we got closer and closer I continued to zoom in, and we eventually found a nice campsite where the shelter was supposedly located, but no real shelter. Darn! What a disappointment! But there wasn’t much we could do. There was a small stream flowing nearby, so we stopped and filtered more water. That last scree climb had drained our supply. By the time the filter was put away we were really and truly cold. Time to get moving! And then, to our surprise, a couple hundred yards down the trail a structure became visible. It was the shelter! Hallelujah! 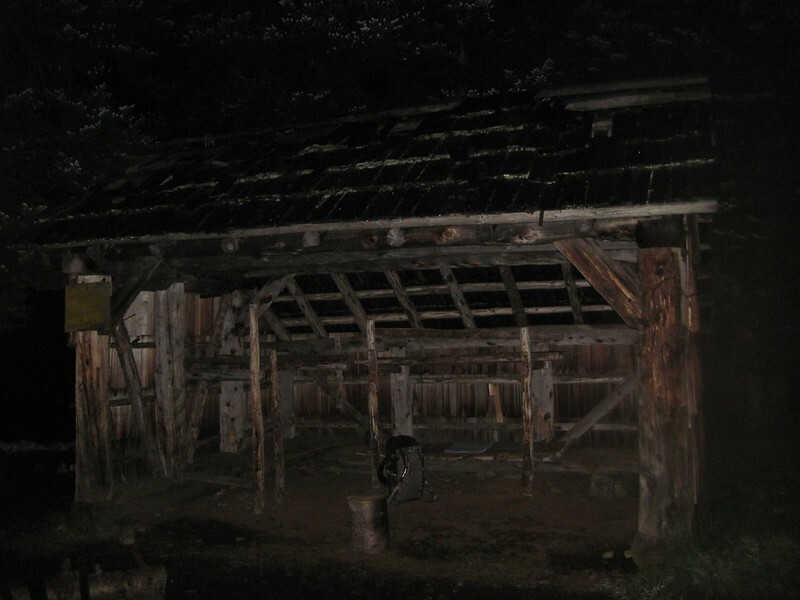 It was an old ramshackle-looking place, with three walls and a roof, but it was dry inside, and had a number of bunks made of wooden slats and primitive log supports. It was time to make the decision: To rest or not to rest. We wanted to get to the car as soon as possible, but we were also bone-tired. I sat down and studied the GPS and the map. It was midnight. At our current rate of hiking we would arrive at the trailhead before dawn, and hitchhiking in the dark is never a good idea. So we opted for a few hours rest. 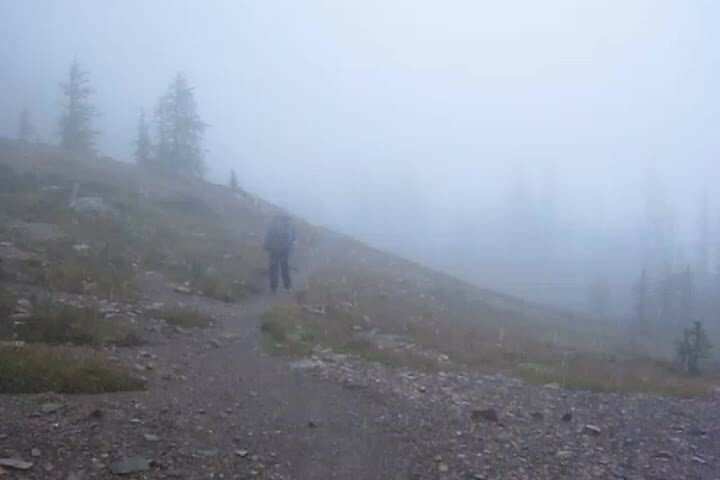 We also wanted it to be light for the final switchbacks on the five thousand foot descent, as we had no idea how steep and slippery it might be. We changed into our warm dry clothes and felt better almost immediately. We also decided to get out two of those tiny rolled up Space Emergency Blankets that we’d been carrying in our packs (unused) for the last twenty years. They were crinkly and loud in our ears, but we wrapped ourselves inside them to retain some of our precious heat and to keep out the breeze. And they actually worked! Amazing, but true. We fell asleep almost instantly. I’m not saying we slept really well, on a hard flat bed with a microscopically-thin piece of aluminized plastic for insulation, but we slept. Eventually, however, as the night air cooled around us, we began to feel the chill creeping in. I checked the time and it was three AM. It was time to get up. At that point we realized that we had to put our wet clothes back on. They’d been hanging in the shelter, but they hadn’t really dried out at all; they were cold and clammy. But did we really have to? After all, we were heading out to the car, not another night in camp where warm dry clothes would be essential. Hmmm… The Boy Scout in me said “Be Prepared!” and voted to suffer the soggy shocking horror, saving the dry gear for an emergency, but the realist in me immediately vetoed this madness and proposed a compromise: Keep the core warm, keep the feet dry, and let the legs fend for themselves. Good plan. We got as packed as possible and saved the pants for last. Whooo! That really woke us up! On we hiked, into the dark of the night. Seven more miles to go. Luckily, the trail along this stretch was quite pleasant. It wasn’t overly steep, and wended it’s way through woods and meadows. We passed people camping in tents, sleeping soundly, oblivious of our problems. As planned, it began to get light as we reached the final switchbacks down into Canyon Creek. Supposedly, there are 55 switchbacks on this section of trail, but it felt like 155! Down and down and down we hiked. Although the canyonside itself was very steep, the trail’s grade never became dangerous, and we reached the bottom without incident. It was seven AM, and we had hiked over seventeen miles in thirteen hours or so (including a three hour rest). All while climbing 4300 feet and descending 8400 feet total. Not bad! 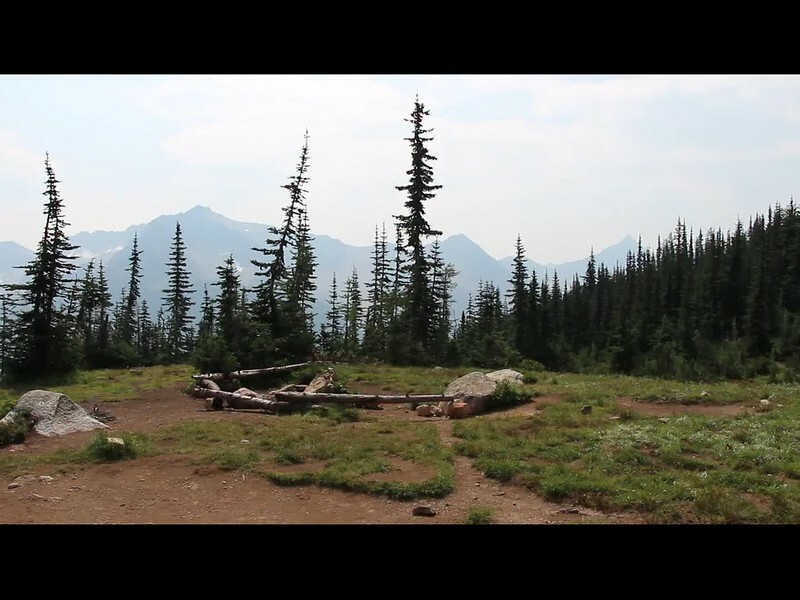 Video of Majestic Mountain and McCay Ridge from the Jackita Ridge Trail near McMillan Park. The road is 5000 feet below! Eventually we came to a huge log bridge that extended over Canyon Creek, which was running strong down here (unlike far upstream where we’d easily jumped across it two days prior). 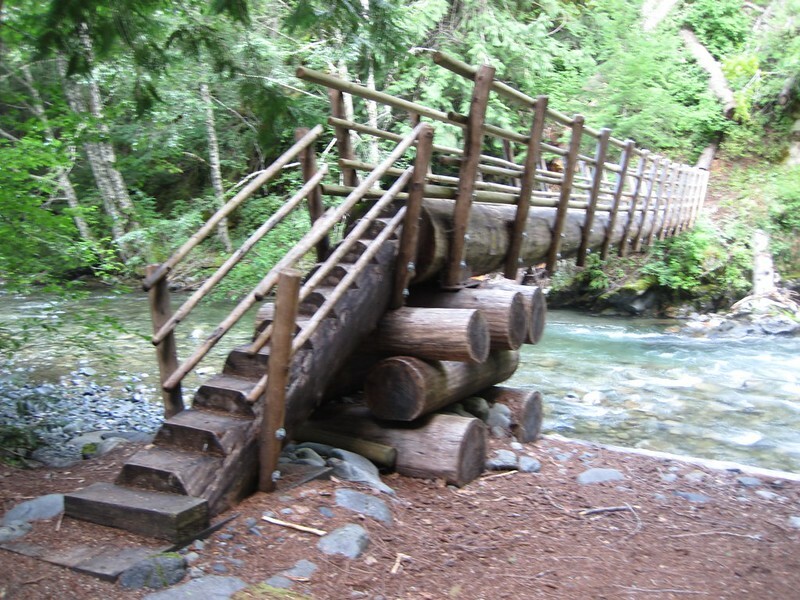 The bridge had sturdy wooden railings and everything. Really quite an impressive bridge. 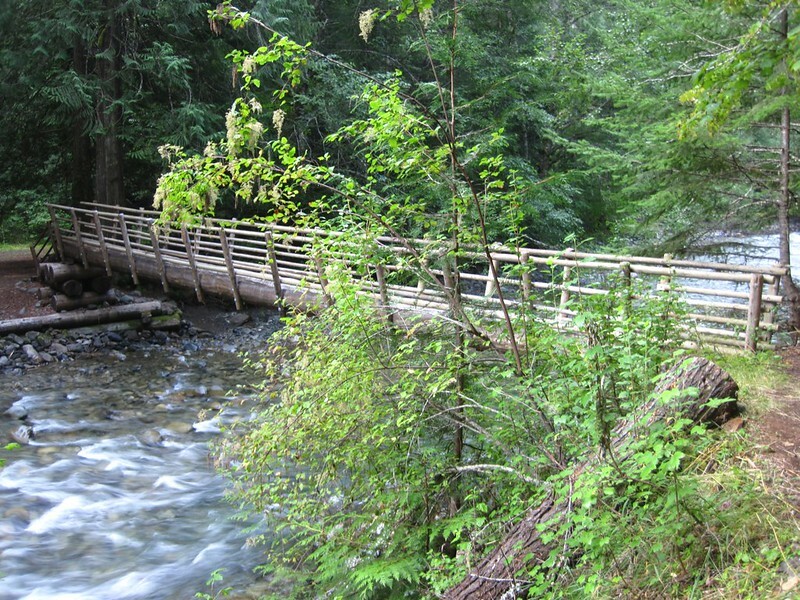 Huge log bridge over Canyon Creek on the Jackita Ridge Trail near the trailhead. What a beautiful bridge. And I sure was glad to avoid fording that swift cold creek! 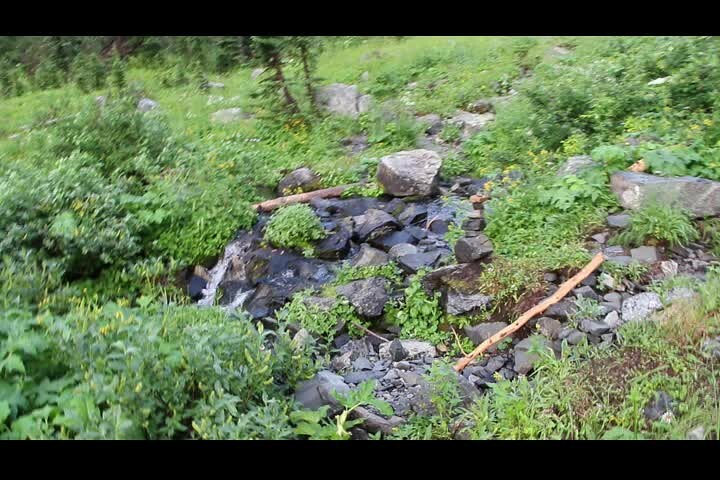 Video of Granite Creek flowing under the footbridge on the Jackita Ridge Trail near the trailhead. We hiked a bit further and crossed an even bigger metal-beamed footbridge over Granite Creek, and spied a piece of guardrail on the main highway not far away through the brush. The hike was over. 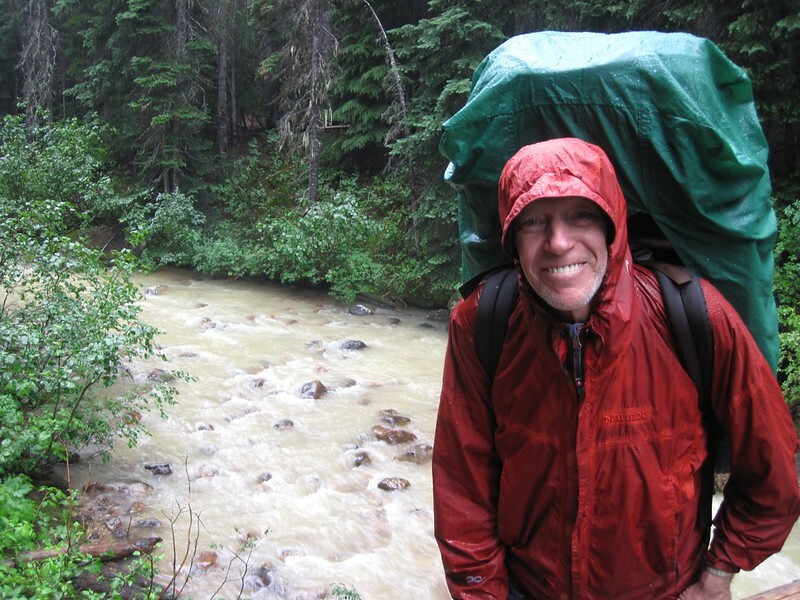 We stopped to remove and pack away some of our soggiest raingear, and tried to make ourselves a bit more presentable in order to get a ride right away. And it worked! We stuck out our thumbs and the very first car gave us a lift. Yes! He dropped us off right at our car in the Ross Lake parking Lot. We drove west toward Seattle and got the medical attention we needed, and life was good again. We were sorry that we never got to take that boat ride down Ross Lake, or were able to view the glacier on Jack Mountain from the top of Devils Dome, but we still had a great time, and really enjoyed the Cascades and the Pasayten Wilderness. What a beautiful area!